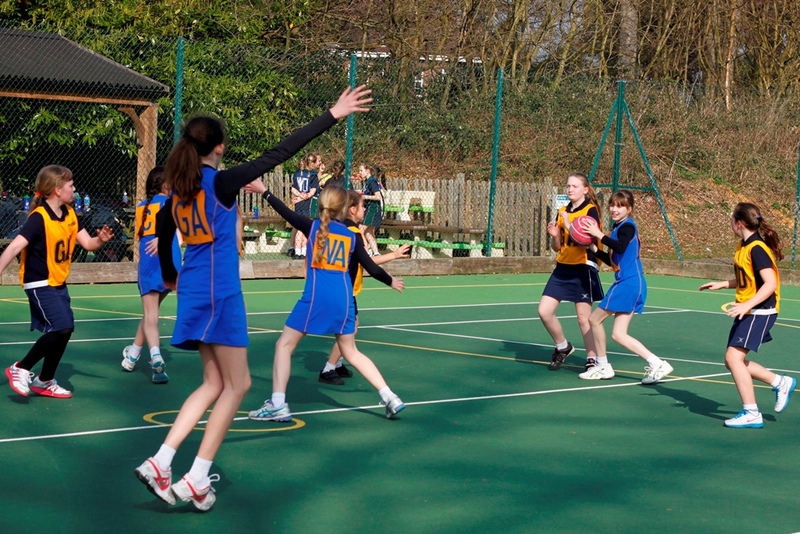 As part of the School PE curriculum the Junior children have one netball lesson per week. 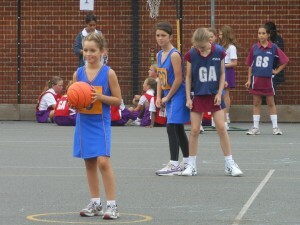 There is also Netball Club which is offered to all Junior classes. 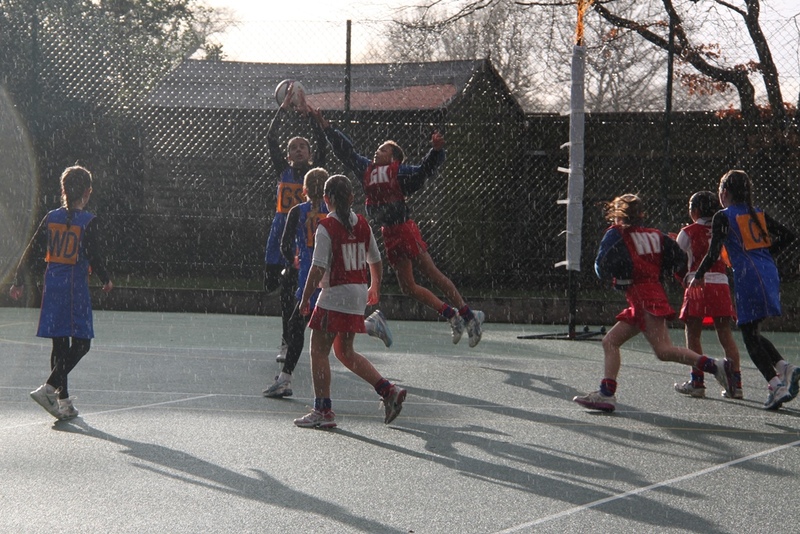 Over two days the junior girls participated in the Inter-house Netball Competition. Each team prepared their squads for 3 competitive matches against the other houses. Every game was played competitively, but in good spirit. 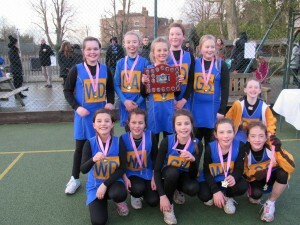 The girls thoroughly enjoyed playing together and competing for the trophy. 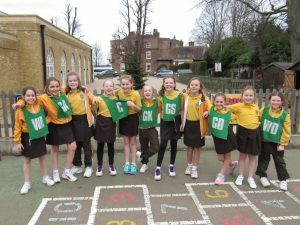 There were some fantastic displays of netball and teamwork, with each squad having a mixture of Year 3- Year 6 girls playing alongside each other. Well done to all involved. The girls played extremely well all day. They won 4 games and lost 1 game in their group stage, meaning they came second in their group. 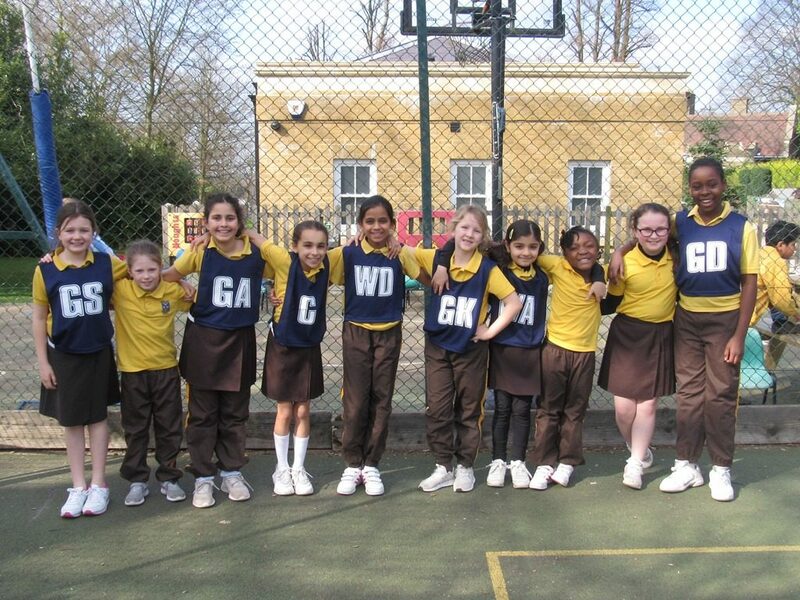 The team progressed to Division 1 along with Alleyn Court, Widford Lodge and Oakfields Montessori. The team lost to Widford Lodge. 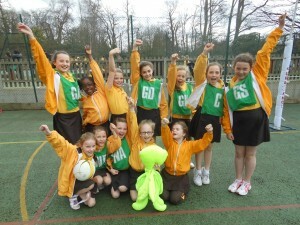 The team won against Oakfields Montessori. 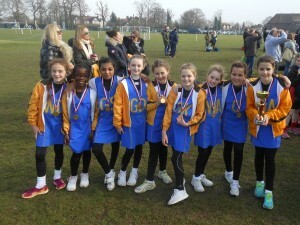 Overall, the girls played fantastically and they came third. The girls were thrilled to bring home bronze medals. The girls played extremely well all day. They won 3 games and drew 2 games in their group stage, meaning they came second in their group. 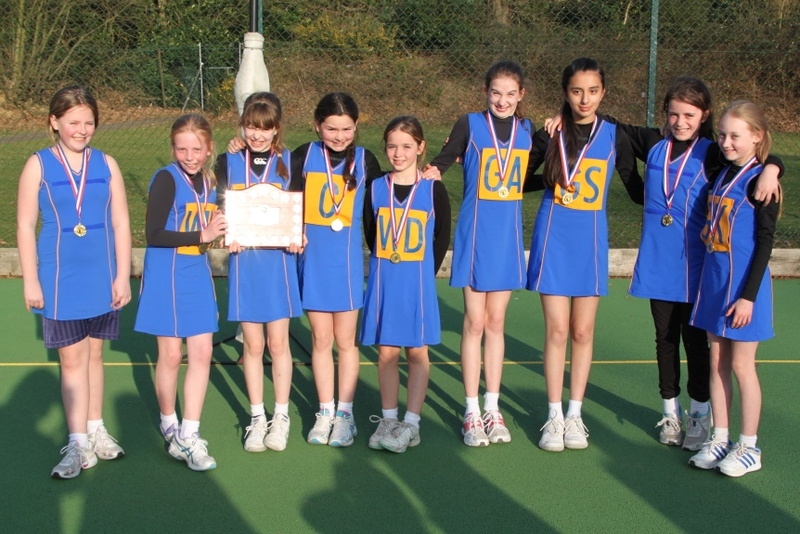 The team progressed to Division 1 along with St. Cedds, Widford Lodge and Brentwood Prep. 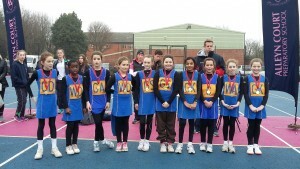 Overall, the girls played fantastically and they came second. 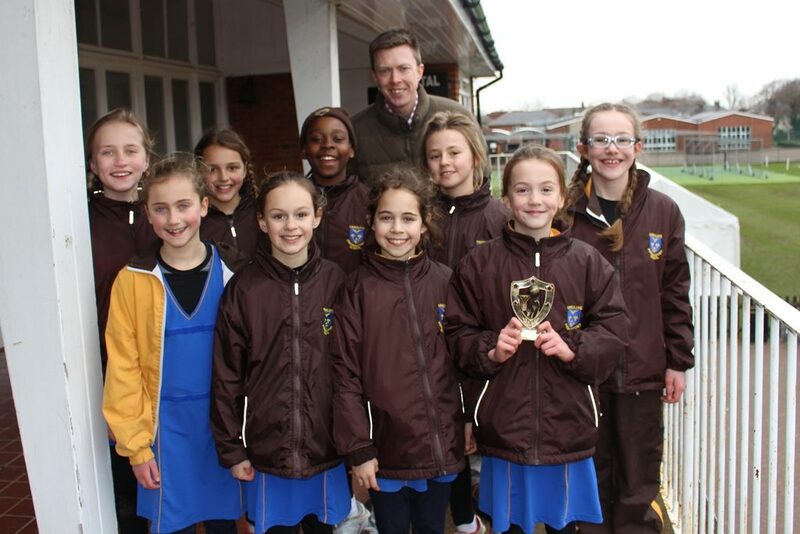 The girls were thrilled to bring home the Runner’s Up trophy and silver medals. 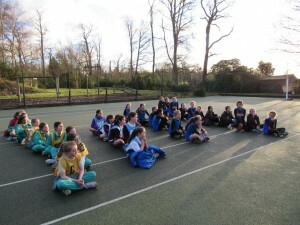 On Wednesday 6th March the girls had an exciting, but long day of netball at Bancroft School. They began in the pool stage, playing five matches and winning four. The girls topped their group and qualified for the Cup Competition. This involved the top six teams at the tournament. In the quarterfinals, the girls played a strong St. Cedd’s team, and won 7-1. The semi-finals was a difficult game and unfortunately, the girls lost to St. Aubyn’s (the eventual winners of the tournament) 4-1. In the final bronze medal match, the team faced St. Edmunds for the second time. 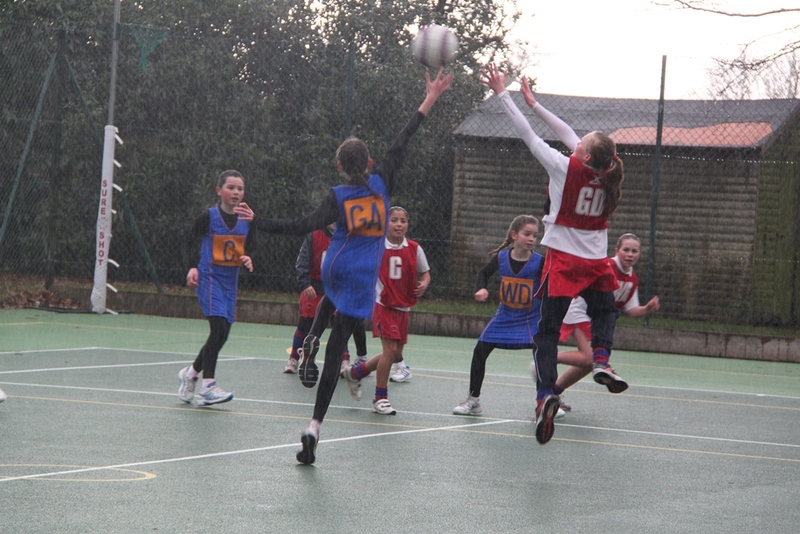 It was wet and windy and the girls played superbly, but unfortunately, they lost out narrowly 3-1. 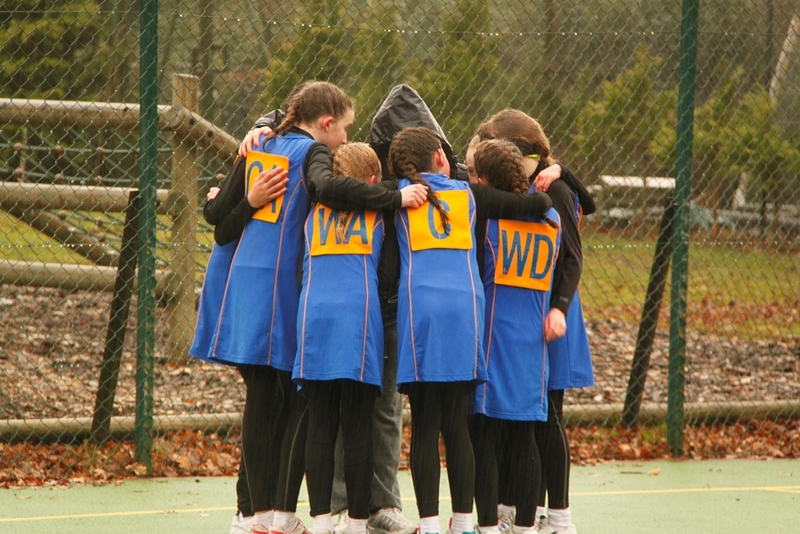 Overall, the girls put on an incredible display throughout the day – playing some of their best netball this season and they should be very proud of coming 4th out of 24 teams on the day. 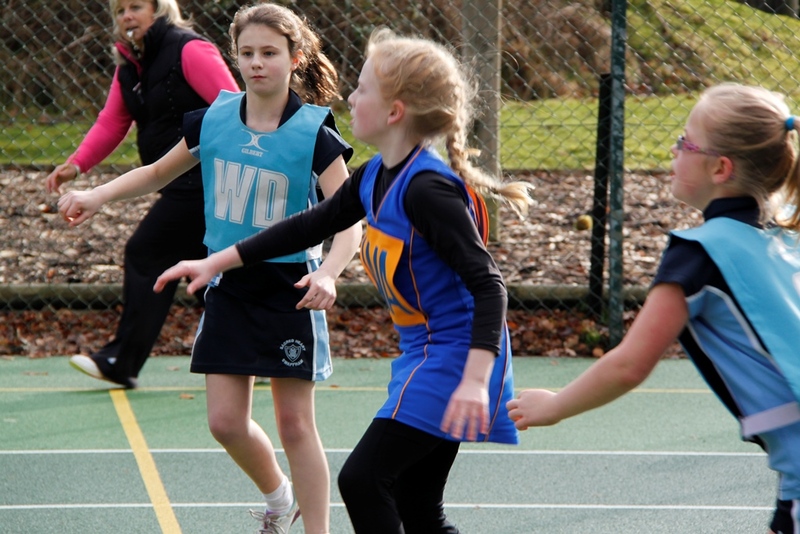 During the group stage, Ursuline A were undefeated in their group against Ingatestone and Fryerning B, Herington House and St. Peters B, which meant they progressed to the knock out stage of the competition. 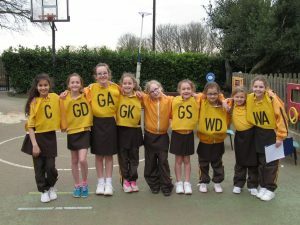 Ursuline B, which was mostly younger players from Lower Two, won one match and lost two, against tough competition including St. Helen's A, St. Peters A and Willowbrook. They all gained valuable experience for the future. Overall, the girls were disappointed by the result but they should be very proud of their performance. They thoroughly deserved their silver medals. Well done to all the schools that took part. 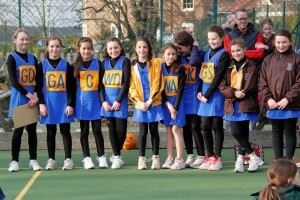 A thoroughly enjoyable afternoon of netball. 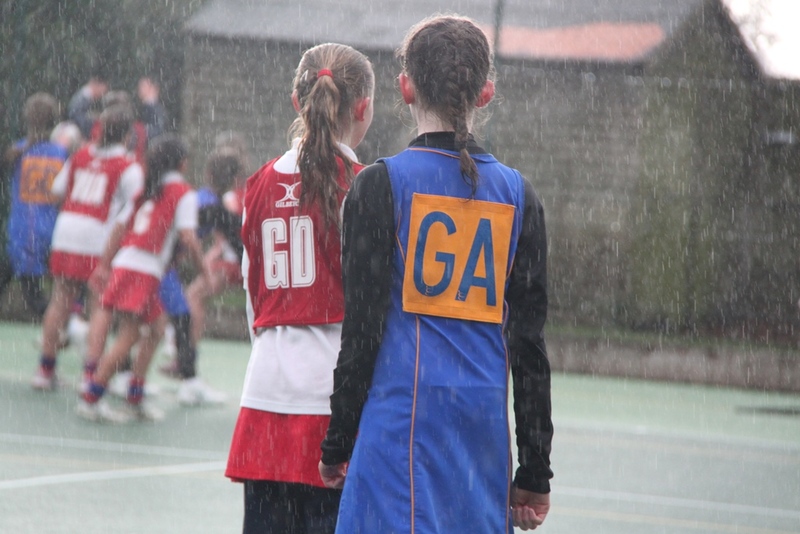 Despite the weather forecast looking ominous, the U11 Netball team travelled to Alleyn Court, Southend, to participate in the ISA Regional U11 Netball Tournament. 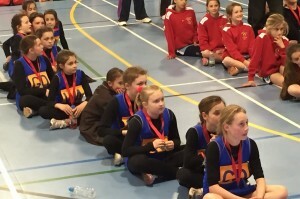 The girls faced strong competition from schools across East Anglia. 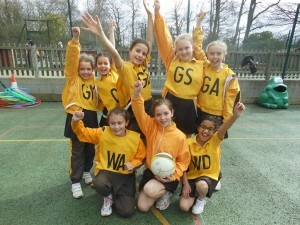 They played extremely well and finished top of their group, being unbeaten across four matches. 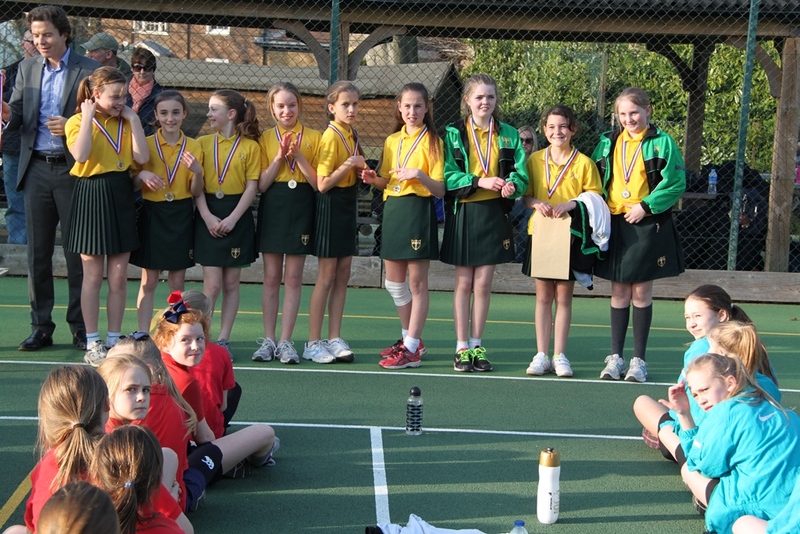 Results included St. Johns 7-0, Colchester 11-0, Alleyn Court 5-3 and Heathcote 14-0. The team then moved onto the Semi-Final, knockout match. It was tightly fought out between UPS and Littlegarth. The girls played extremely well, but had certainly met their match. At the end of the final whistle, the score was 5-5, taking us through to extra time. With the new score-line at 2-2, there was still nothing that could separate the teams, so we extended the match to Golden Goal. Unfortunately, Littlegarth came through and clenched the win. However, the day wasn’t over. The girls still had one more chance to secure their place at Nationals. 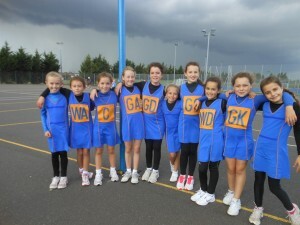 They faced Alleyn Court in the play-off match. Showing grit and determination they secured a convincing win of 5-1 and now look forward to heading to York in March to compete on a National Platform. 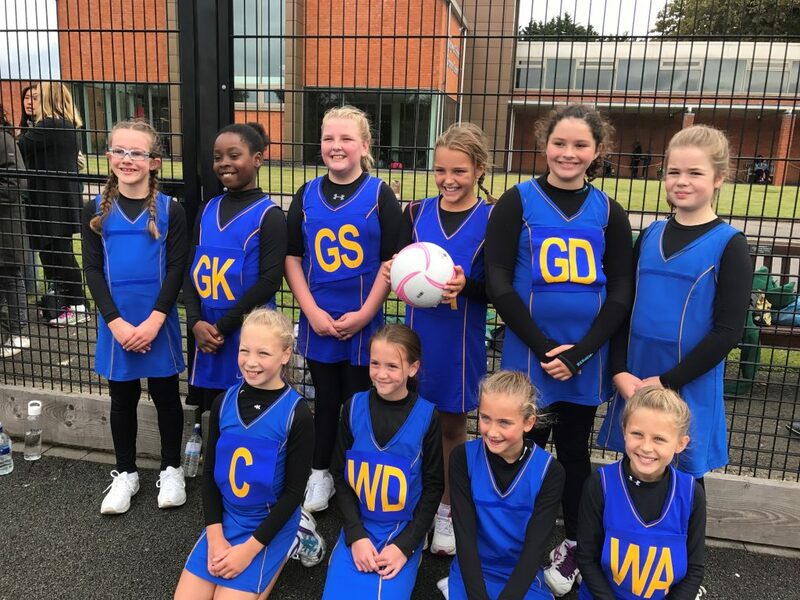 On Saturday, 8th September, two netball team consisting of girls from Upper Two, Lower Two and Upper One went to Chigwell School for the first Netball Tournament of the season. Lower Two and Upper One tried their best playing against older children. 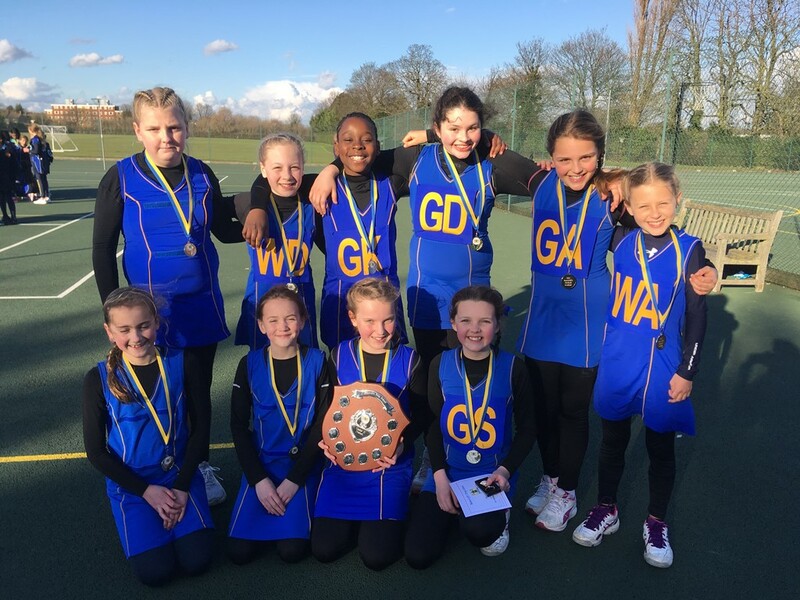 Upper Two were undefeated beating Chigwell, Brentwood and Forest’s A teams and retained the shield. On the weekend of 11th/12th May the Senior Netball Team drove the long 5.5 hours journey to Queen Ethelbugra’s Collegiate School in York. This event had been postponed from March when the Beast from the East had hit. 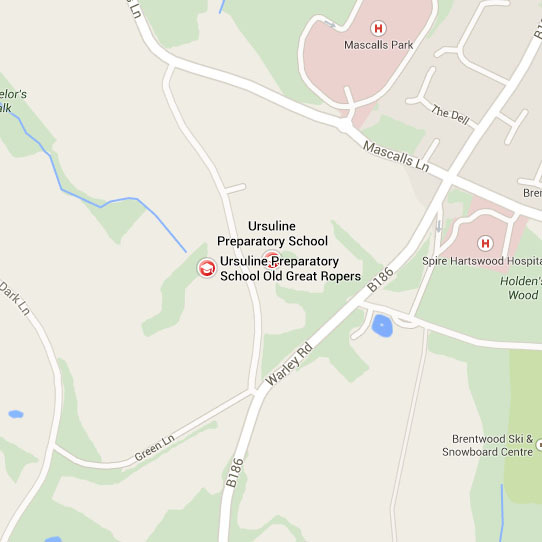 The team left school at lunchtime on Friday 11th May and stayed overnight at the school. After an early start they participated in a very lengthy morning programme. The girls were very tired and narrowly lost the first match 6-7 to the team that went forward to the semi-final. Although the girls played really hard they were hit with injury and although they won a large number of games finished in the 10th position overall. The girls were obviously disappointed but they should be proud of their achievement. Over 400 schools participated in the initial stages of this competition and they achieved an incredible result considering we are such a small school compared to many of the other schools participating. We were very grateful that every team member had a parent who gave up their weekend and were prepared to undertake such along journey to support their child. I would like to thank all of them for their tremendous support. 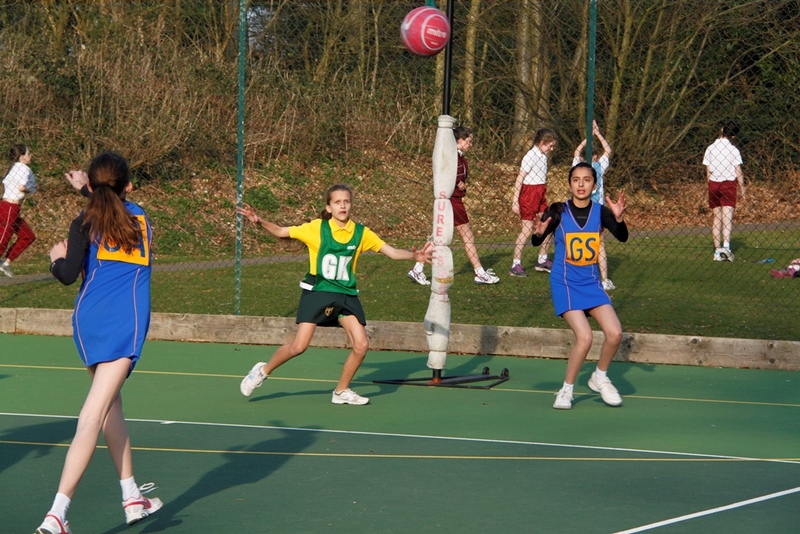 The annual Inter-House Netball Competition was held on Monday, 19th March and Thursday, 22nd March. 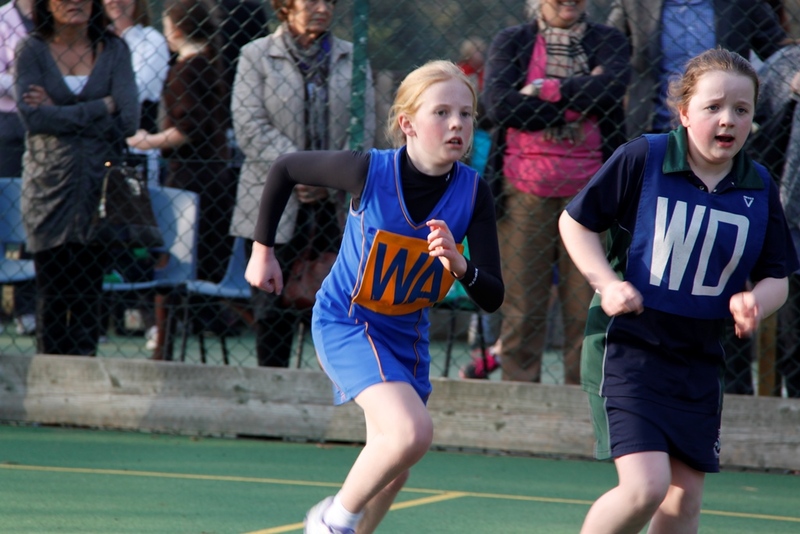 It was a very close event with all junior children taking part and doing their best to represent their house. The final result was, St. Andrew 4th, St. David 3rd, St. George 2nd and St. Patrick 1st. 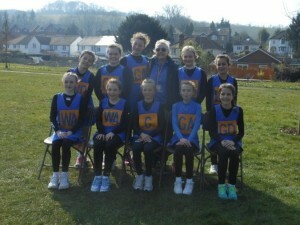 Congratulations to the netball team. 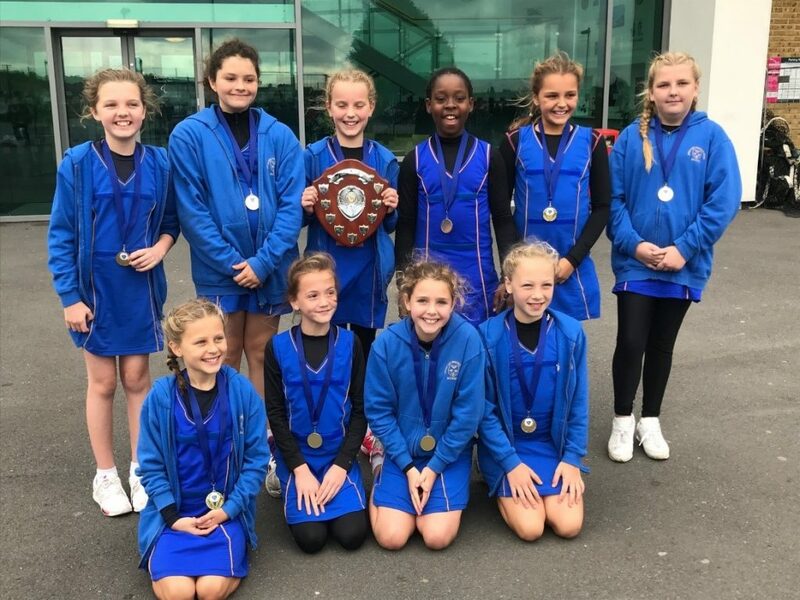 The girls all played very well in the District Competition held at Brentwood School, and are now District Champions once again. Our thanks go to Miss Allen for organising the event and to the staff and parents who helped and supported the girls by spectating! 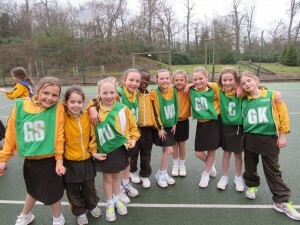 On the 9th March the U10 team went to Brentwood School to participate in the U10 Netball Rally. 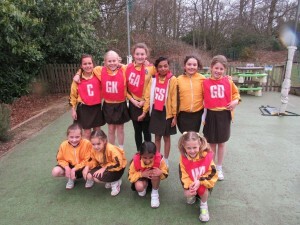 They all played extremely well – winning all of their matches and being unbeaten throughout the tournament. St. Michaels, 10-0. St. Marys 7-0. Widford Lodge, 2-0. St. Helens, 2-0, Grafton, 6-1. We came top of our group, going through to the 1st division. Playing against St. Aubyns, winning 3-2, St. Helens again, winning 1-0 and Beam Primary, winning 5-0. The girls were extremely proud to be coming home with the trophy! 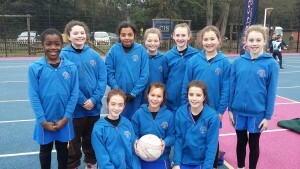 On the 7th March the U11 netball team travelled to Bancroft. They had a tough group, but played extremely well winning 3 matches (Oaklands 4-0, Chigwell B 6-0 and Coopersale 5-2), and drawing one match against St. Aubyns 2-2. We came top of our group, but missed progressing to the Cup Knockout stage based on one point in goal difference. The team then went through to the Shield Knockout where they beat New Hall 4-2, reaching the final against North London Collegiate School. This was an extremely competitive match, going to extra time for the trophy. The girls fought hard and pushed until the end – winning 4-2. 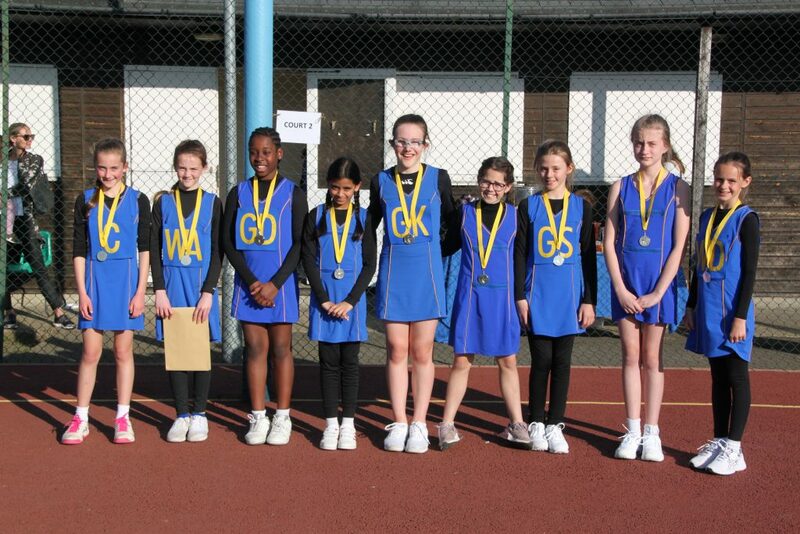 It was an excellent day of netball and the girls came home with Gold Medals and a Shield. 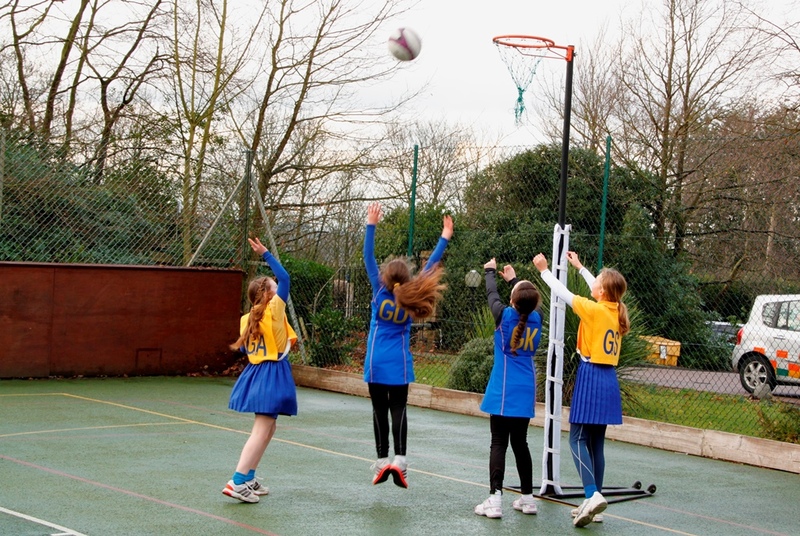 On Wednesday 31st January, the U11 Netball team travelled to Alleyn Court School and participated in the ISA Regional Tournament. The girls all played extremely well. 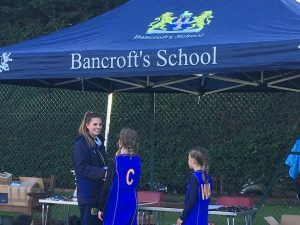 They were unbeaten in their group against opposition including: Sancton Wood, Gosfield, Alleyn Court and Heathcote, and they made it through the knockout stages to the final. The girls beat Littlegarth in the semi-final 9-2, but unfortunately, lost narrowly against St. Margaret’s School in the final match 7-2. 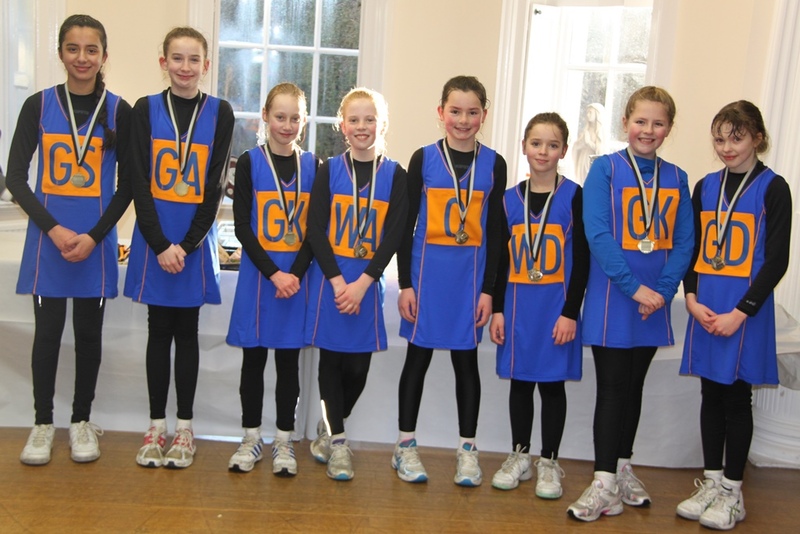 The girls came away with well-earned silver medals and will be representing the East of England at the ISA National Tournament in March. Well done girls and good luck! 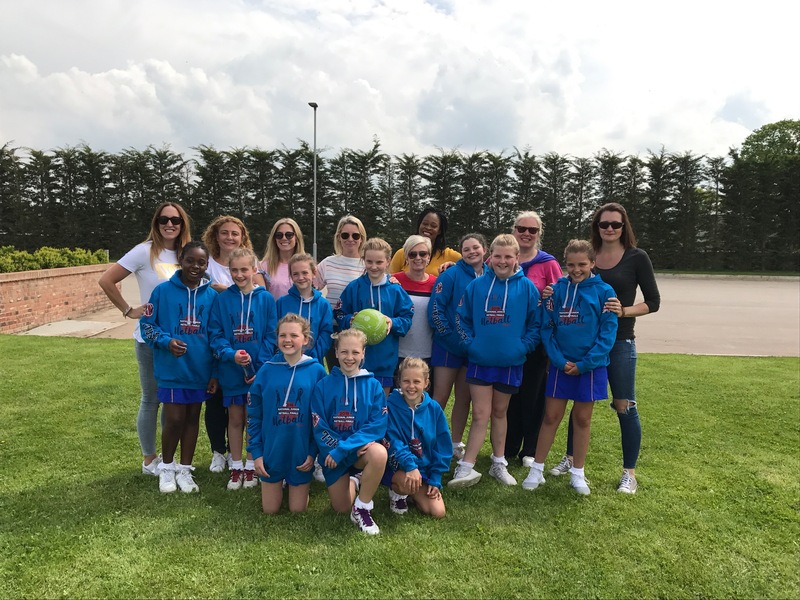 On Friday 13th October Miss Allen and Mrs Coffey took the Year 6, U11 netball team to Redbridge Sports Centre to compete in the Forest U11 Netball Rally. They competed again 25 other schools and finished as rally winners. All 10 girls played extremely well and worked together as a team. They had four matches in their opening group against St. Edmunds, Coopersale, Theydon Bois and Forest C Team. The girls were undefeated in their group with a close match against St. Edmunds at 6-5 sealing their position in the winners pool for round two. 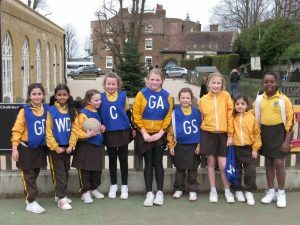 The girls then faced another four matches against tough competition including Mossford Green, Colfes, Berkhamstead and St. Aubyns. Again the girls were undefeated with some convincing scores of 6-3, 9-1 and 6-1. Overall, the team played extremely well despite having eight games on the trot! They worked hard and remained disciplined throughout the tournament and they sailed to victory winning all eight games. 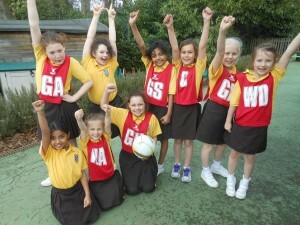 On Sunday 16th September a team of Year 5 and 6 girls won the Chigwell Netball Rally. Fourteen schools, split into two groups, competed in the rally. The team won all of their group games with some very emphatic score lines. Their final group match against St. John Fisher was an 18-0 victory. Following on from this performance they met St. Edmund's A Team in the final. They proved very tough opponents but with team work and determination they finished triumphant 4 - 2. 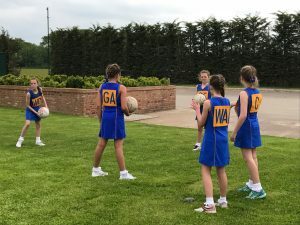 Following their winning performance at the regional ISA Netball Rally the U2 team travelled to Peterborough on the 25th of March to represent East of England in this national event. After the morning session, the girls were placed first out of the 18 teams representing all the other regions of England. 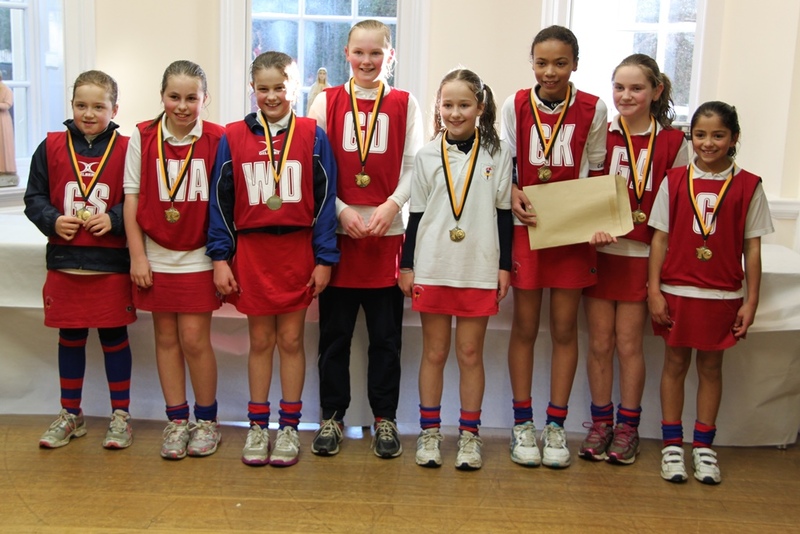 In the afternoon they won all their matches bar one which they narrowly lost. 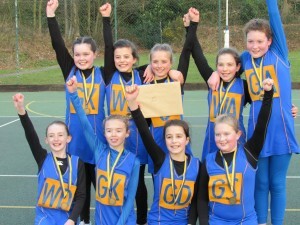 They won their final game which placed them 3rd in the county. Congratulations to all the players and coaches on such as incredible achievement. Despite the weather this annual event went ahead and all of the Junior girls were invited to represent their house. 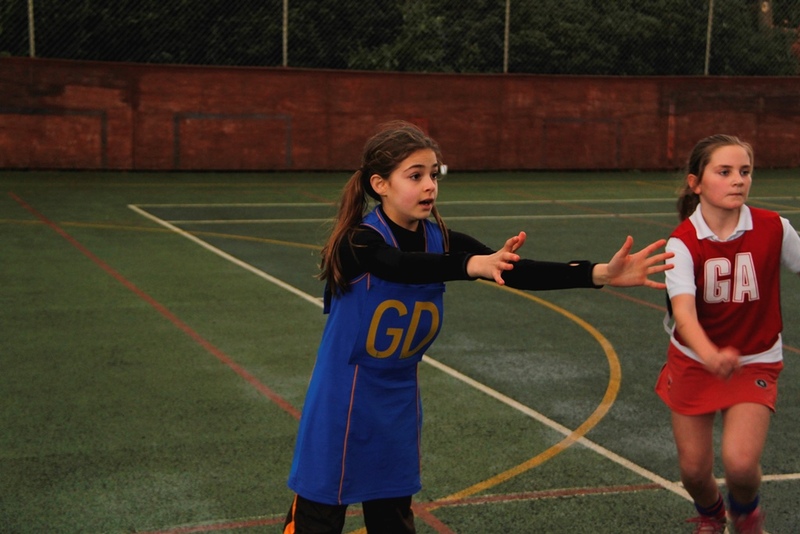 There was some very competitive netball played with all of the girls trying their best. The eventual winners were St. George with 8 points, 2nd place St. Andrew's with 6 points, joint 3rd was St. David's and St. Patrick's, tied on 5 points. 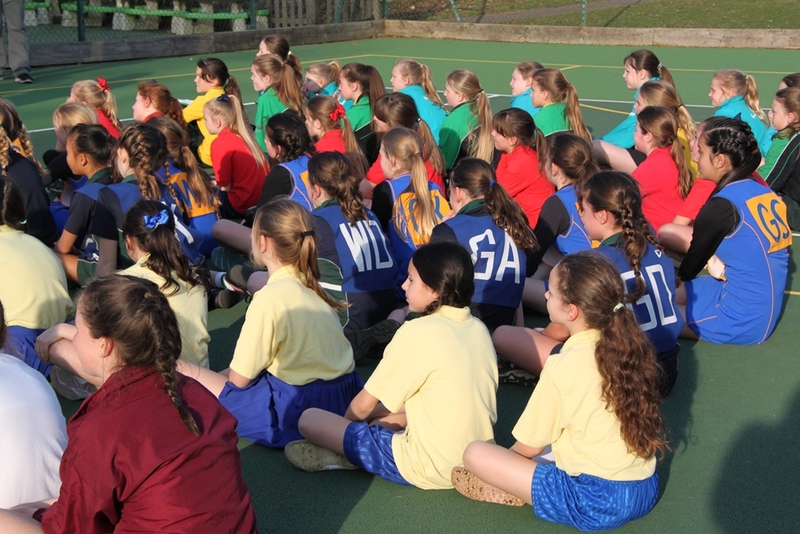 On Friday 17th March Mrs Coffey and Mrs Mongelard took all the girls from Upper One to the annual New Hall Netball Rally. 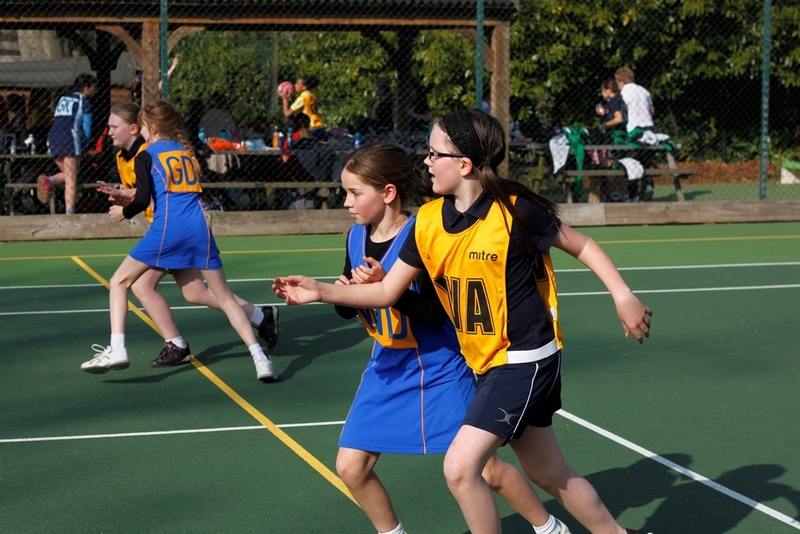 They initially played four matches against; King’s Ely, NewHall A, Alleyn Court and St. Cedd’s. The girls qualified for the semi-finals where they had a tough match against Widford Lodge playing extremely well and finally winning the match 4 -3. 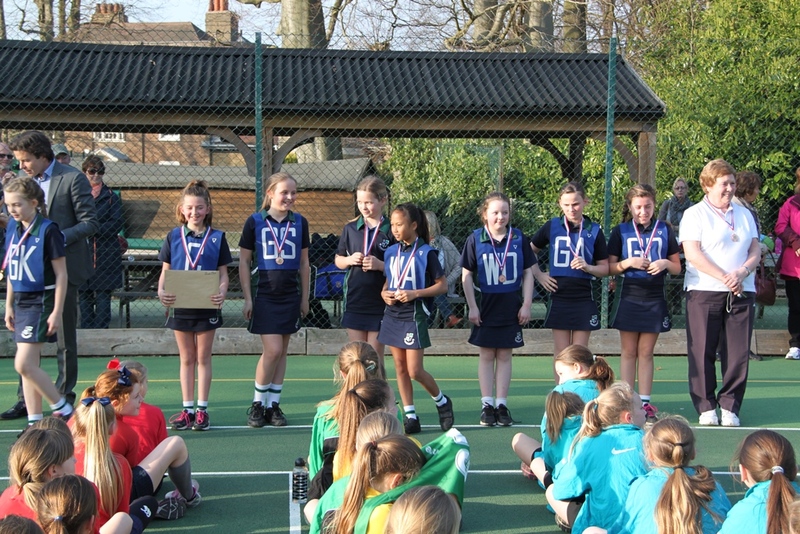 In the final they played St. Cedd’s winning 6 -0, making them the overall winners of the tournament. 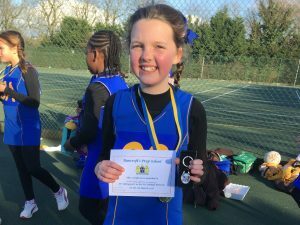 Both of these tournaments took place on Friday 10th March, therefore a team from Year 3 and 4 went to the New Hall Rally and a team from Year 5 attended Brentwood School. 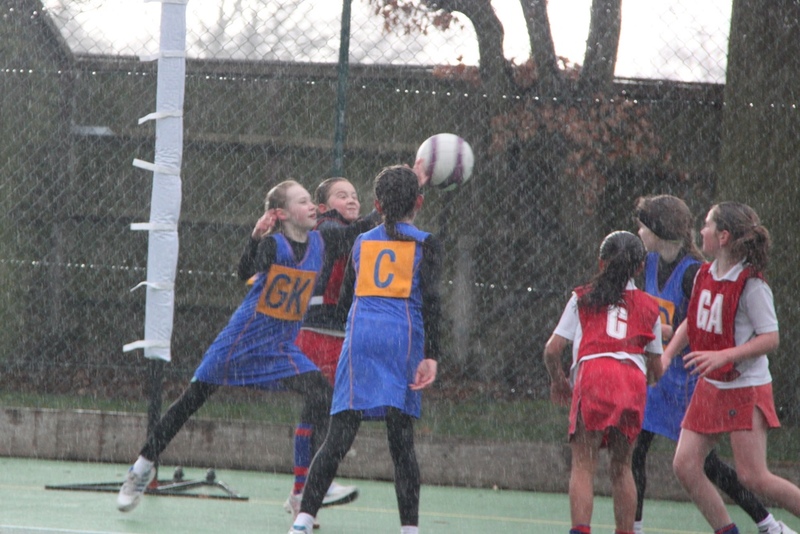 At New Hall School, the girls played exceptionally well winning most of their matches in the first round but being knocked out in the semi-final of the plate by one goal. 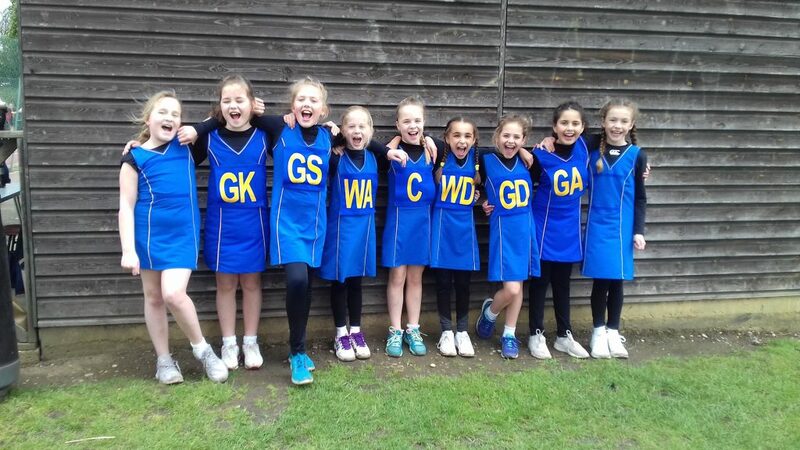 At Brentwood School, the girls had many tough matches but played their best winning a couple of matches but unfortunately not taking them through to the semi-finals. 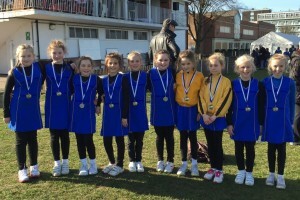 Well done to all of the girls who played. St Martin’s School kindly allowed the use of their facilities to run this rally with 12 local schools entering. There were two pools of 6 teams with our ‘A’ team in the ‘A’ pool and the ‘B’ team in the ‘B’ pool. The ‘A’ team won all their games. In the final they met St Helen’s Juniors and played two excellent halves winning 9-1, thus winning the title and the shield. Congratulations to the ‘A’ team and to the’ B’ team who finished 9th overall. 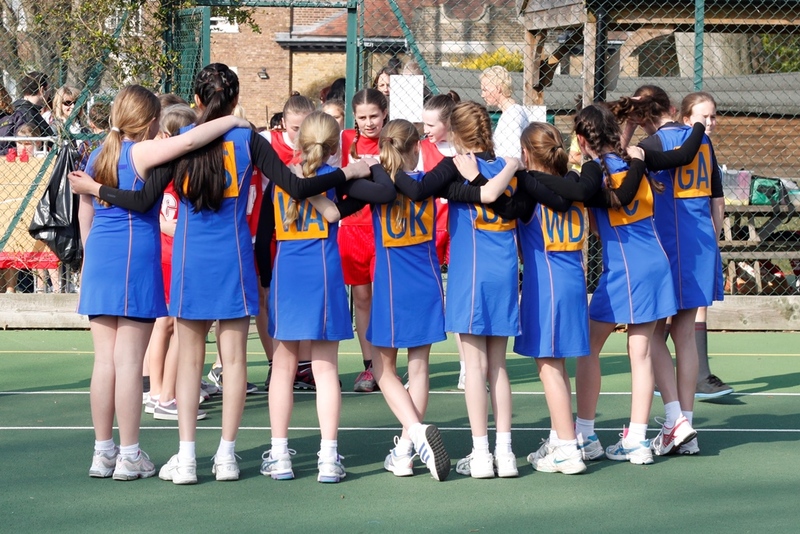 The school netball team played in Bancroft’s annual netball rally on Wednesday, 22nd February. This is always a hugely popular rally - 20 schools entered this year. 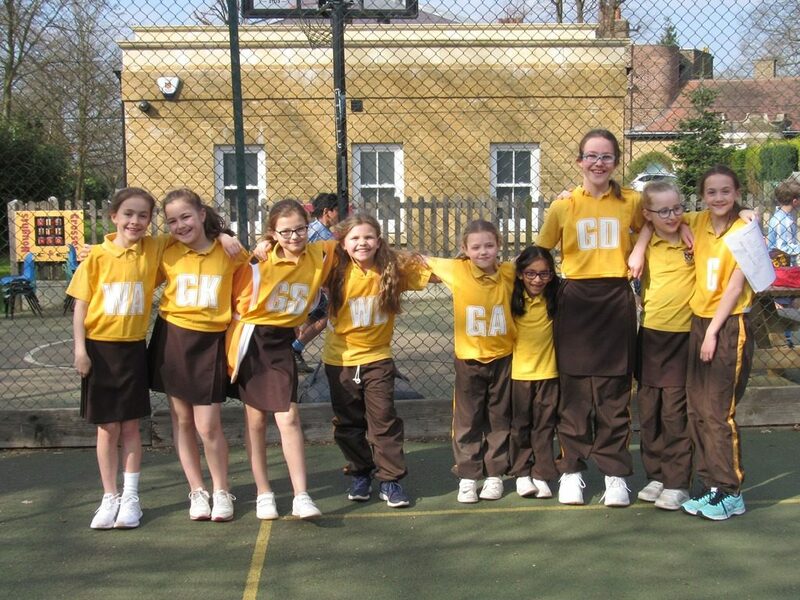 They played well in the qualifying games and reached the semi-finals and played against Chigwell A team and won 7-3, taking them through to the finals against St Joseph’s of Wanstead. 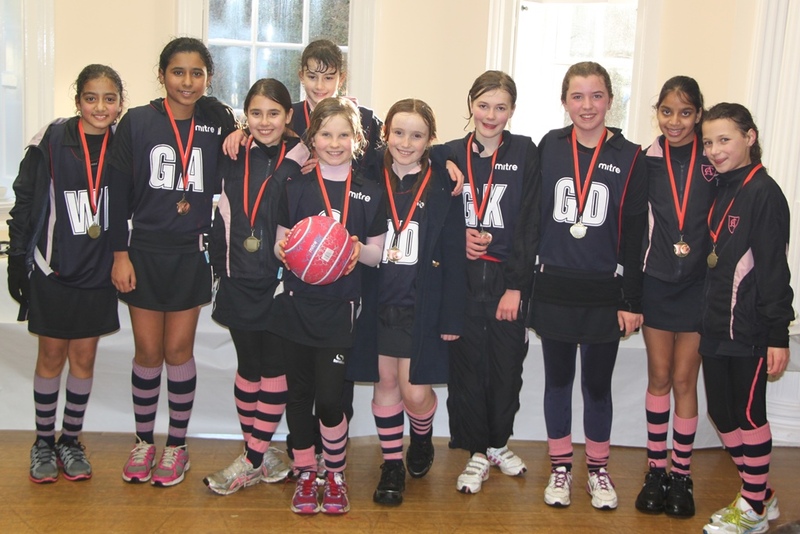 Although the girls played exceptionally well, they lost by 2 goals, finishing as runners-up. 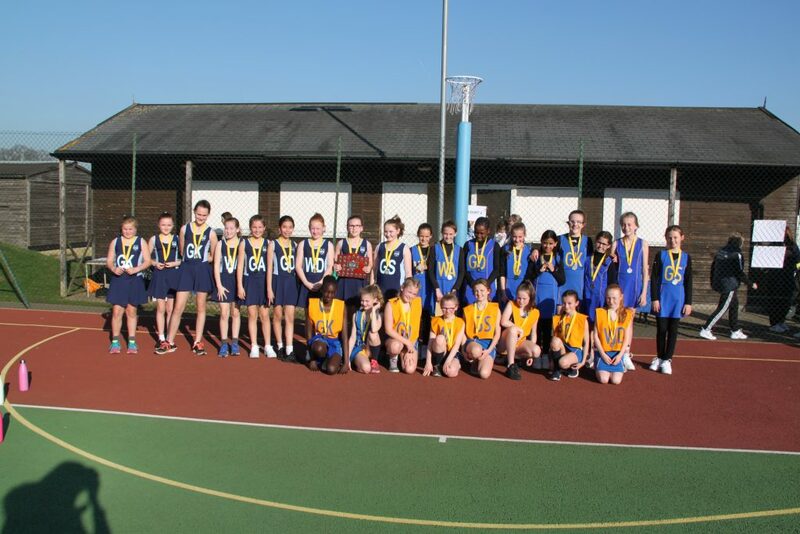 This annual competition took place at Alleyn Court, Southend on Tuesday 31st January. In the group stages, the team won every game without conceding a goal. In the semi-final they met Littlegarth, winning 7 -3. 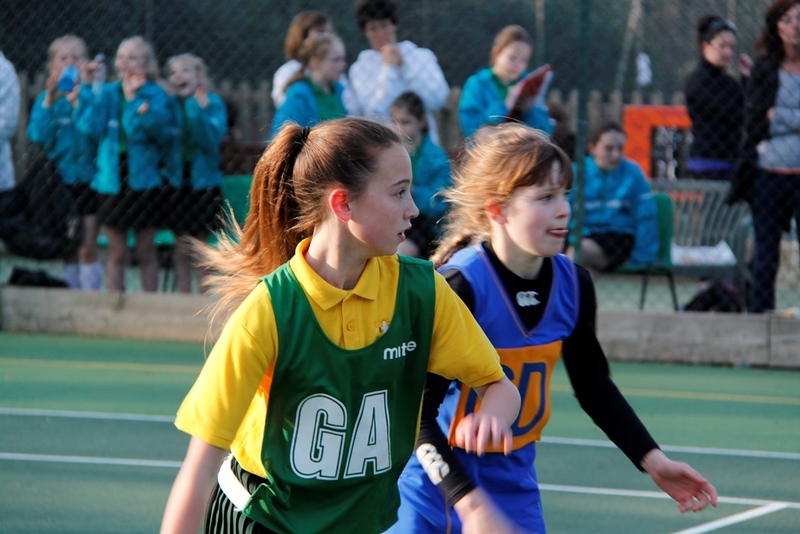 The final followed against St. Margaret’s, which the team won convincingly 7 – 1. 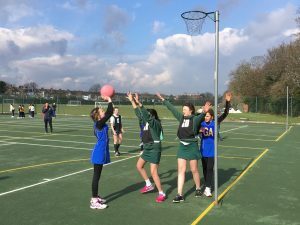 As a result of their excellent performance, the team will now proceed to the ISA National Netball Rally which will be held on Saturday 25th March at Oundle School in Peterborough. 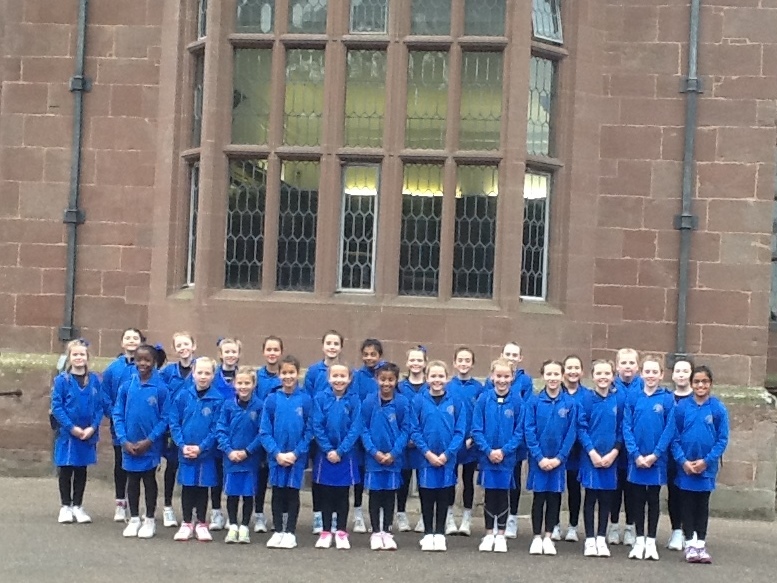 The girls from Upper and Lower Two competed in a residential netball tour organised by the ISA at Condover Hall in Shropshire. 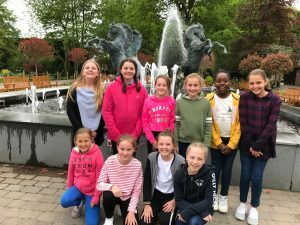 In addition to playing a netball tournament they also participated in many other activities, such as abseiling and ‘the climbing wall’. 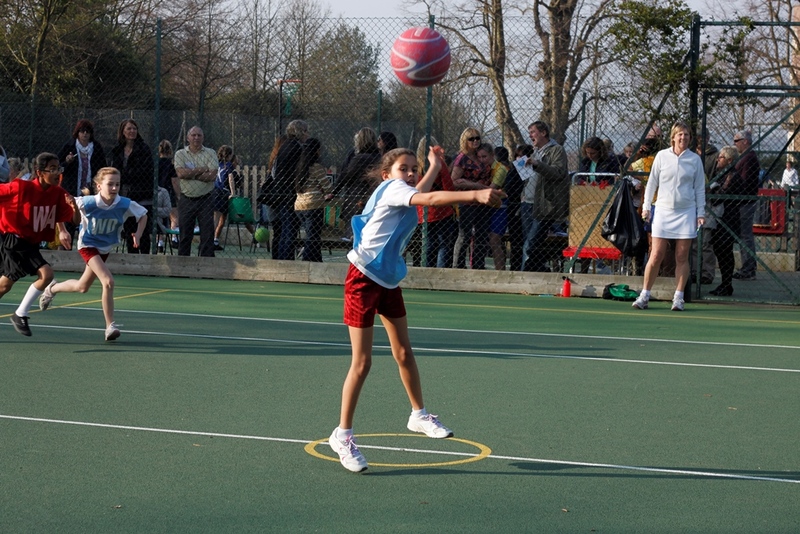 The tournament was played on a round robin basis with the 9 competing teams all playing against each other. The Ursuline ‘A’ team were the eventual winners and were delighted to be presented with a trophy by England netball player, Stacey Francis. Please visit the Gallery to see more photographs from this event. 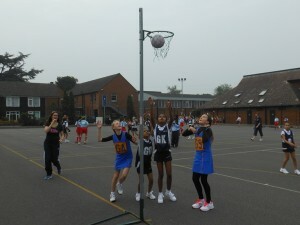 On Thursday, 24th March, we held an inter-house netball competition. It was a very close event and the final results were St. George’s 1st, St. Andrew’s 2nd, St. David’s 3rd and St. Patrick’s 4th. 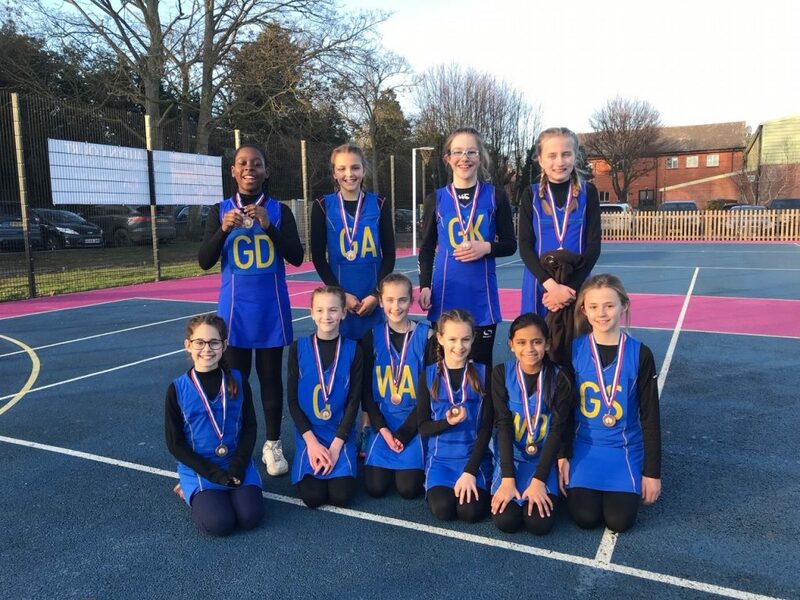 Following their performance at the ISA Regional Netball Rally the U11 team qualified for the National Netball U11 competition on Thursday 17th March at Kingsmead Netball Centre, Buckinghamshire. There were 21 prep schools that had qualified from all over the country and Ursuline Prep was placed in a pool with 6 others. Their first 4 games were tremendous - winning all 4 easily - but the hardest game was against Study Prep who won 1 - 7. However, the team won their last game which which meant they qualified the quarter finals where they played Falkner House and won 4 - 0. 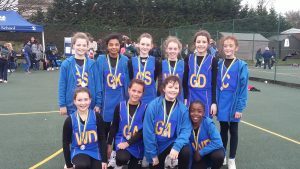 In the semi-finals they were defeated by Lingfield school. All the girls were a credit to the school and played exceptionally well. Congratulations on coming 3rd in the competition. 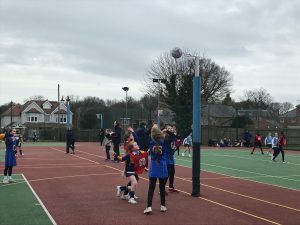 On Friday 11th March, the Lower Two netball team participated in the U10’s Brentwood Netball Tournament; the competition consisted of two groups and two rounds. The girls played 5 matches in round one winning every single match. 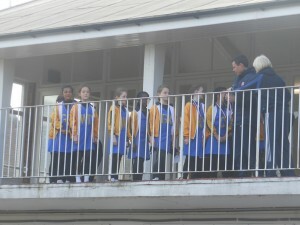 This meant the girls were playing the winners and runners up of both groups. 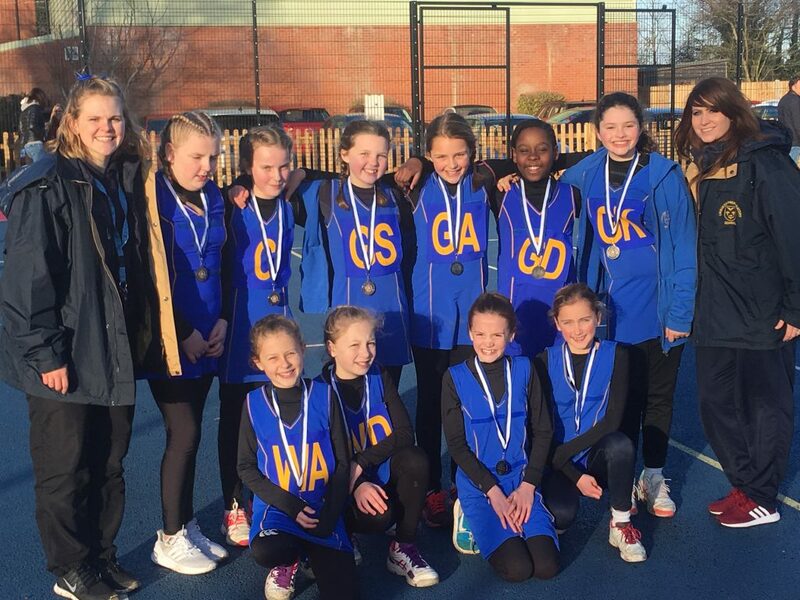 The Ursuline Prep netball team played extremely well in round two and won the tournament overall, which is a fantastic achievement! 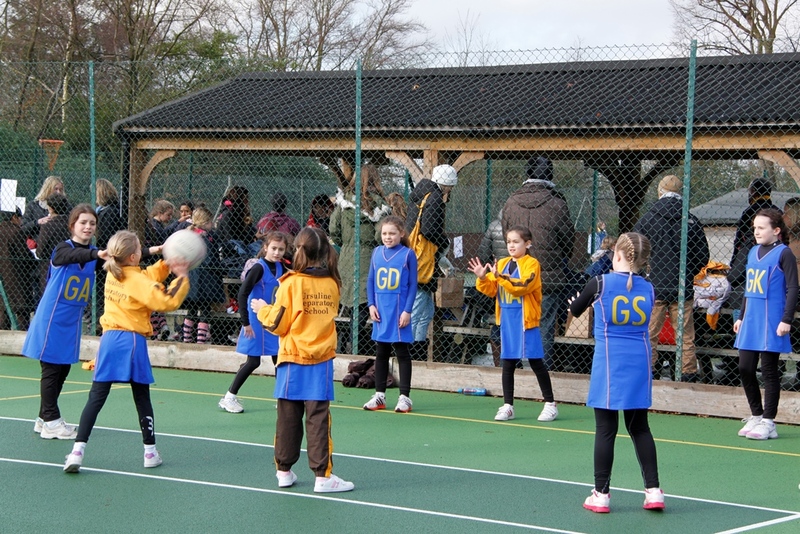 We again hosted The Brentwood District U11 Netball rally on 2nd March with 14 schools entering this year, the most so far! Seven teams were drawn into two separate pools to play a round robin in order to qualify for the semi-finals. The weather in the morning was looking unpredictable but we decided to go ahead; however, as the teams arrived the rain started to fall but the staff agreed to continue. Each game consisted of 6 minutes one way play. We successfully reached the final and played against Shenfield St Mary’s, playing two halves of 5 minutes. We were leading all the way and finished with a victorious score of 10-0. We are now not only The East Anglian Regional Champions but also The Brentwood District Champions! 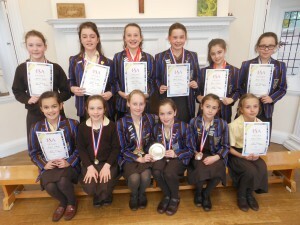 Well done girls - they are fantastic achievements! Thanks go to Miss Peacham for organising the tournament and the staff and PFA for all their help in making it such an enjoyable afternoon. 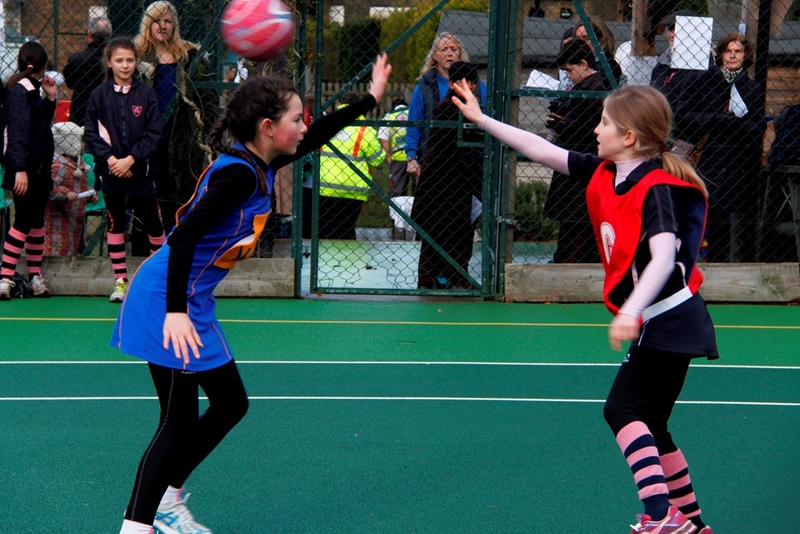 On Wednesday we hosted the ISA regional netball tournament – over 120 girls participated in this event. The whole afternoon was a wonderful experience. Our ‘B’ team were entered at the last moment due to a team illness. They played extremely well, coming third in their group. The ’A’ team were unbeaten in their pool and then went on to beat Thorpe Hall 6 – 2 in the semi-final. 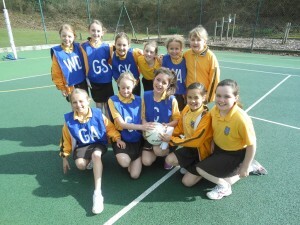 They then met Littlegarth School in the final and, after a very close match, beat them 6 – 4. 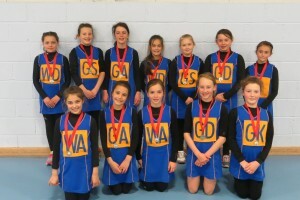 This means our team go on to represent the East of England in the Nationals on 17th March at Rugby School. Congratulations to all of the team members and Ms. Peacham for organising such a wonderful event. Also, thanks to the PFA and school team for helping supervise the event and providing such lovely food for the children and adults. 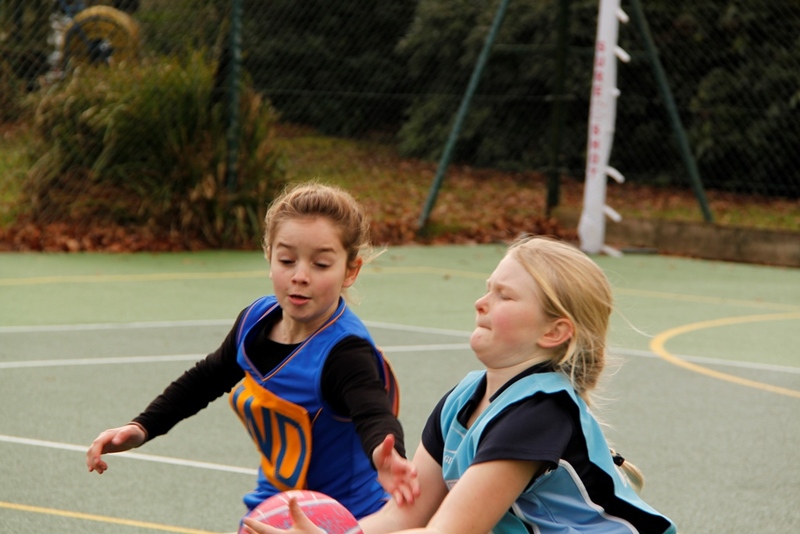 On Friday, 16th October, the U11 netball team participated in the annual Forest Preparatory School U11 Netball Tournament. The team played really well in round 1, winning all their games apart from one which meant they qualified for group 2 in round 2. During this round they won every single game, finishing in 6th place overall out of 25 schools. 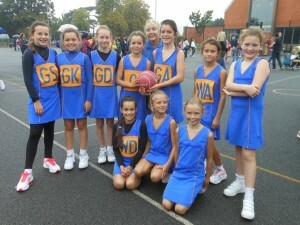 On Saturday 12th September we took a team of 11 girls to the Under 11 Chigwell Netball rally. Sadly, we were missing some of our Upper Two pupils who were sitting an entrance exam, so many of our Lower Two girls were chosen to play instead. We knew this was going to be a tough rally against many older and taller players, but all the girls went into the first game being positive, motivated and enthusiastic. 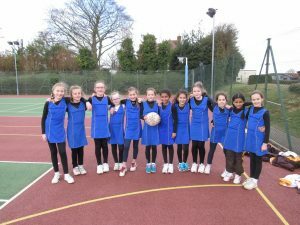 The first match was against Chigwell B team; we won 15 – 1. The second of the pool matches was against Daigen; we won this match 11-0! This meant we went through to the next round, meeting the larger, stronger schools. Our first game was against St. Aubyns, which we won 11 – 0. The second was against Forest Prep., which we won 10 – 3. The next two games were the toughest where we fought hard against Chigwell ‘A’ and won 4 -3, then St Edmund’s where we won 5 -3 . Our final match was against St Cedd’s, which meant if we beat them we would win the entire rally. Our girls were extremely determined to win and played an amazing game with a final score of 11 – 0. We became 2015 winners and received a certificate and a shield so congratulations to all of our girls a fantastic start to the season! 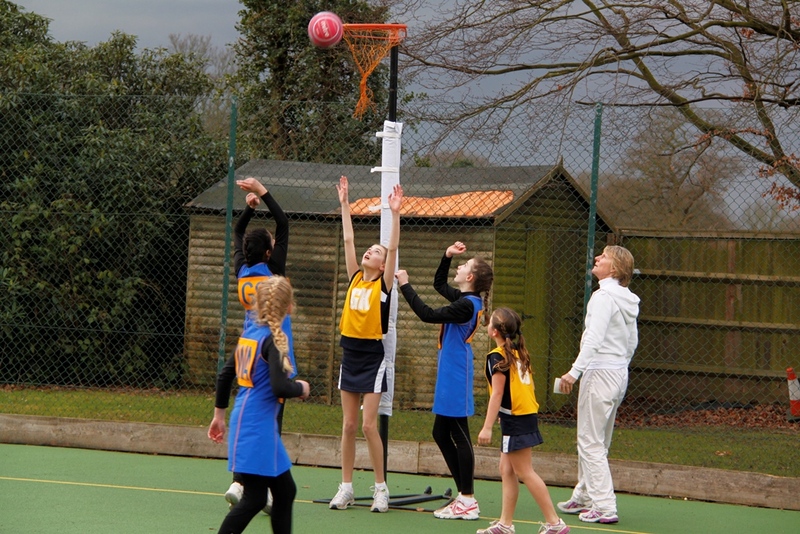 The Inter-House Netball competition took place on Thursday 26th March. The matches were closely contended between the Houses with the final results being St. Patrick’s 4th, St. David’s and St. Andrew’s joint 2nd and St. George’s the overall winners. 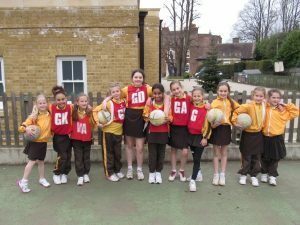 On Friday 20th March New Hall held a Netball Rally for the U10 age group. 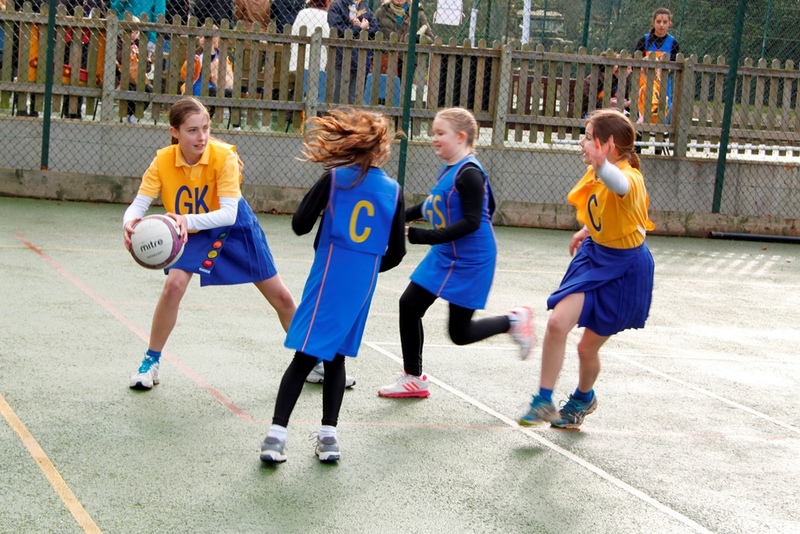 The experience that the girls had gained in the previous rallies and matches helped them to perform really well. 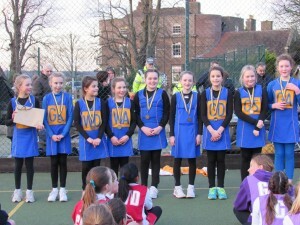 They progressed all the way to the final after an exciting afternoon of netball and finished as runners-up. 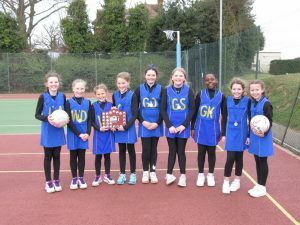 Congratulations to the Netball Team! They did extremely well to reach the ISA National finals, excelling themselves by winning the Plate competition against all other regions in the country. Congratulations to the PE staff and the girls. 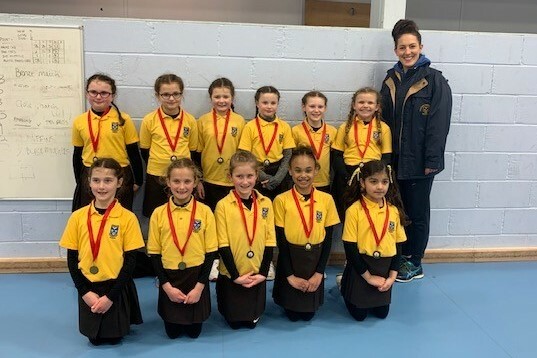 A squad of Ursuline Prep girls from year 4 to 6 competed in the U11 Netball Rally held at New Hall School on Friday 13th March. After a slow start they finished winners of a strong Group B, which included Brentwood Prep, Chigwell School, Alleyn Court and New Hall B. They went on to play New Hall A in the semi-final and won this match 8 – 4. The final match of the afternoon was played against King’s Ely School and despite taking an early 3 – 0 lead they eventually lost 4 -6. 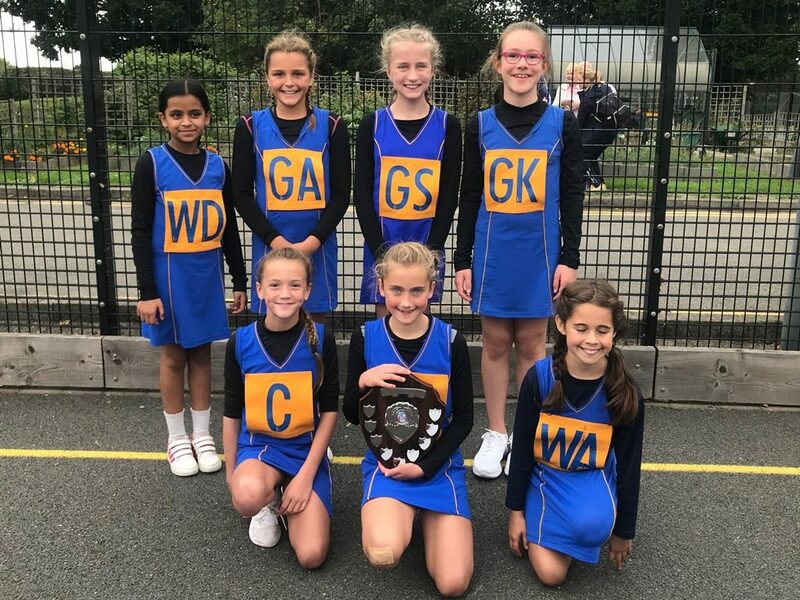 The rally was a real team effort and all the girls should be congratulated on another successful netball tournament, finishing this time as runners-up. 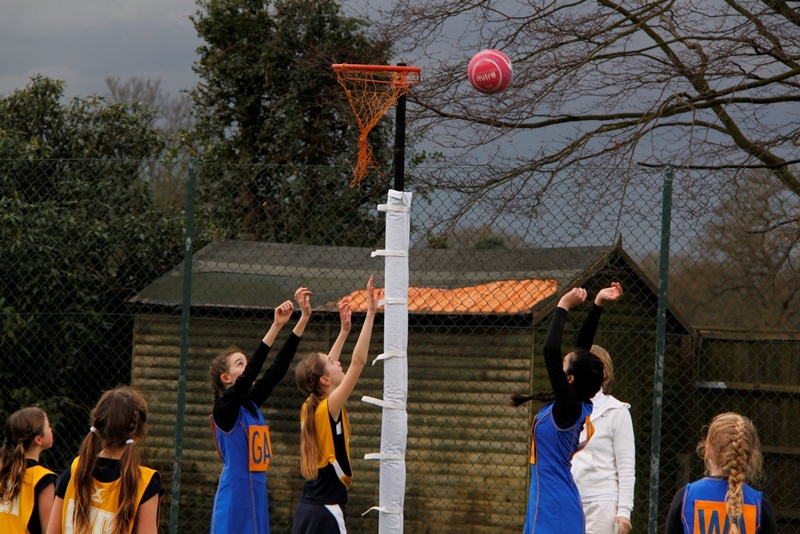 On Wednesday 11th March the netball team went to Bancroft’s School to compete in their annual Netball Tournament. Over 30 teams took part in this very large festival! Our team was placed in Pool B – we won three matches and drew one – this meant we qualified for the top group finals. 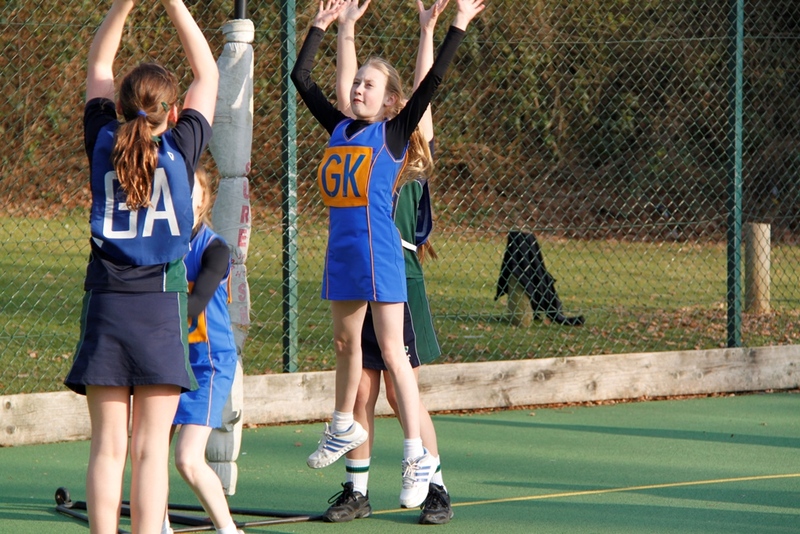 The games that followed were against very tall and tough players and although our girls played magnificently and when the final scores were announced we were absolutely delighted to finish in 5th place. 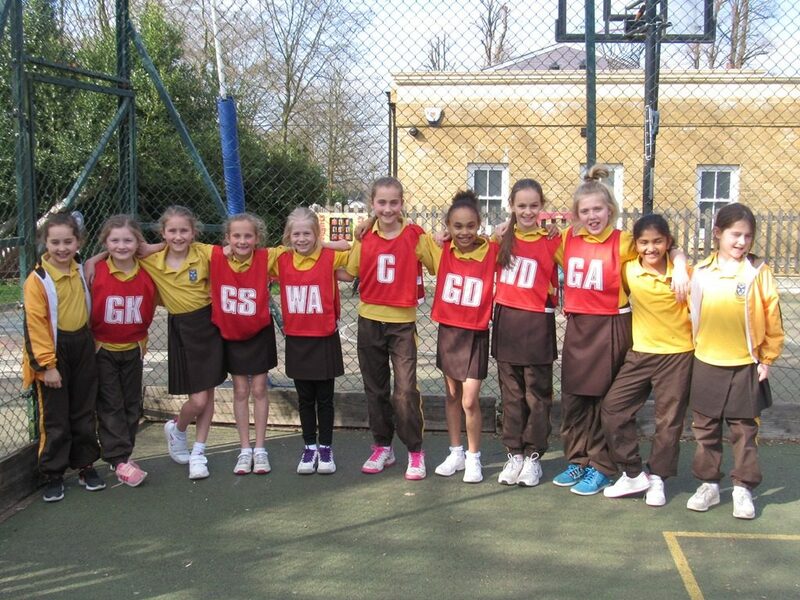 On Friday 6th March the U10 netball team took part in the above tournament, there were 16 schools that participated. Luckily the weather was on our side! The girls fought for every ball and won all their matches in round one. This meant the team qualified for either 1st, 2nd or 3rd position in round two. The girls won against Herington, Brentwood and drew against Beam. The team were awarded 2nd place overall which went on goal difference. Well done to all the girls! 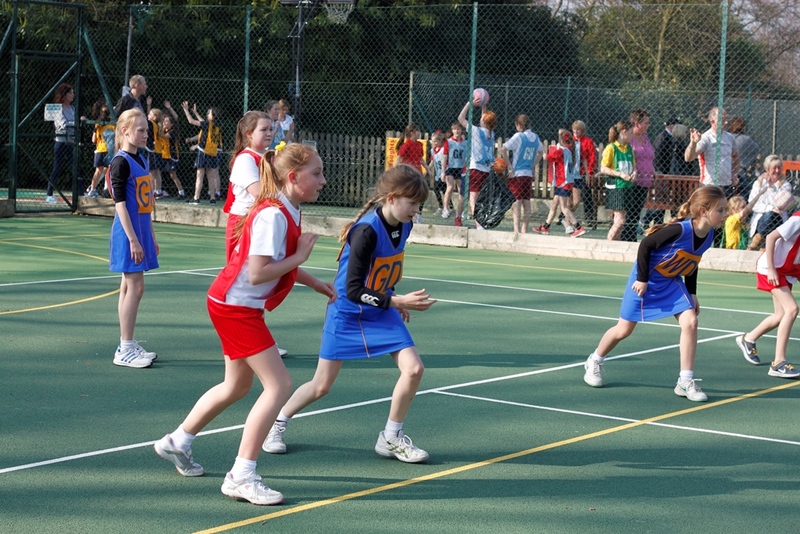 Once again we hosted the District Netball Rally on Wednesday 4th March. We were delighted that even more schools participated and the standard was exceptional this year as many girls now play for local clubs. Our team played extremely well having only 2 goals scored against them throughout the whole pool. Sadly, we went into the semi-finals but lost by one goal. We went on to the playoffs for 3rd and 4th places and won 10 -1; overall we came 3rd. We are now looking forward to the nationals on 19th March. 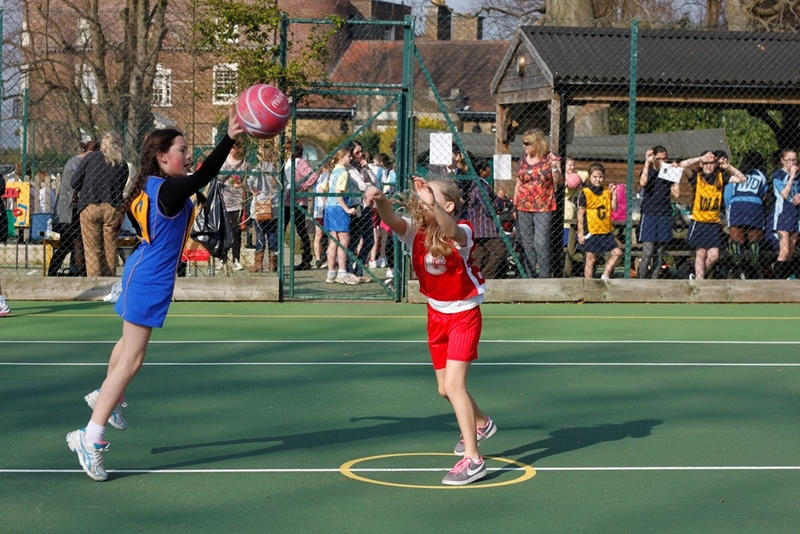 Once again this year we were delighted to host the ISA Regional Netball tournament. We were pleased that the weather remained dry and everyone enjoyed the event. Our team played well but lost 2 matches by the narrowest of margins 3 – 2. However, this meant that they qualified for the Nationals once again. Well done to the girls. The success of the day was due to an Ursuline Prep. team effort. All the staff was extremely supportive and I would like to especially thank Mr. Lewis, Mr. Peters and Mrs. Mongelard. The parents and PFA were very actively involved by scoring and organising refreshments. A special thank you to the Housekeepers for preparing the lunches for 120 children. The L2 (Year 5) team filled in at the last minute and tried really hard but obviously were playing against Year 6 teams from the region. Well done to that team. Thank you to Ms. Peacham for organising such a well-run event. Please see photographs from this event in our Image Gallery. 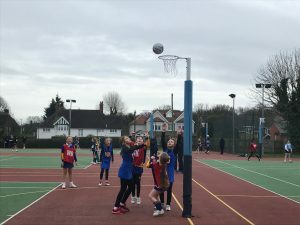 On Friday 10th October, the girls’ Under 11 netball team consisting of Upper One, Lower Two and Upper Two travelled to Redbridge Sports Centre for Forest Preparatory School's annual netball tournament. There were five groups in the pool stages. We were drawn in Group ‘D' with four other schools: Colfe's, Forest Prep ‘B’ team, Eastcourt and Mossford Green. 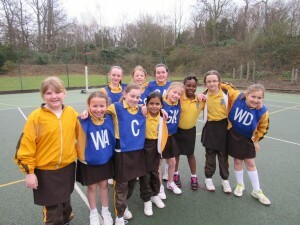 The opening game was against Forest ‘B’; the girls played particularly well managing to win 12 - 0. In the next game we played Mossford Green - they were first to score but we quickly fought back with the final score being 4 - 3. Our next opponents were Colfe's - they proved to be a stronger team and we lost 2 - 6. In the final match of the pool stage we played Eastcourt with a tremendous 18 – 0 win. Unfortunately, as we lost one game we were not able to qualify for group 1 in round 2. However, we went through to group 2 and played a further 4 matches against St Edmunds, Douglen, Forest ‘A’ and WGPS. The girls were superb and won all 4 matches which meant we came 6th overall out of 25 schools. Well done to all the girls in the team. 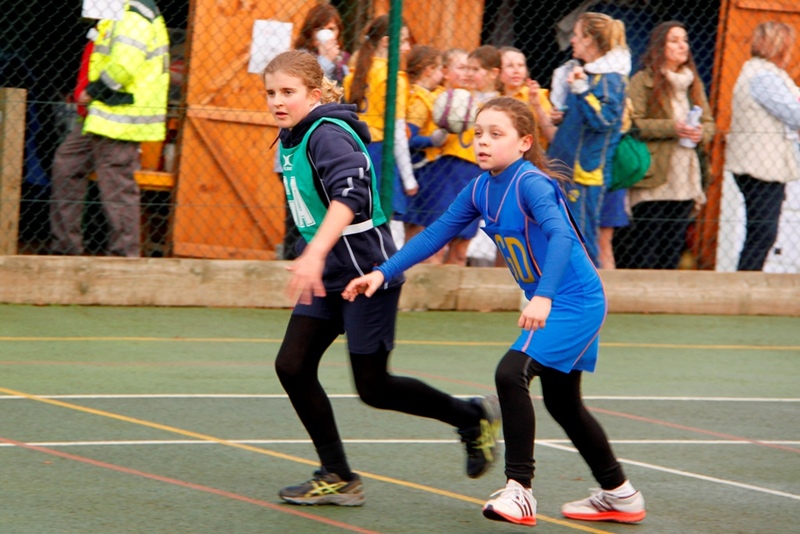 There were 16 schools participating in this, the first netball tournament of the season. 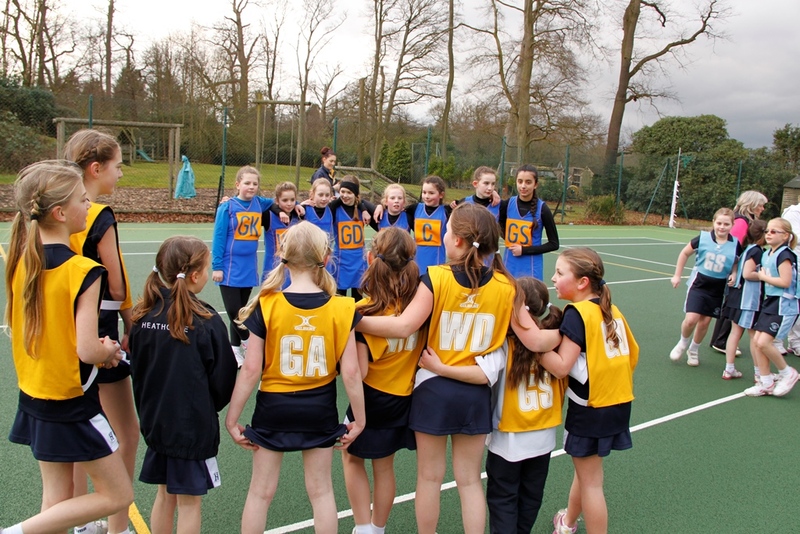 The first match was played against Park School – we won with a fantastic final score of 19 – 1. The second match was against Fairlop School - again we triumphed winning 21 – 0; the final match was played against Theydon Bois which was a tougher game, but we still won 5 – 1. This placed us as winners of our group, meaning the final round was for first place overall. 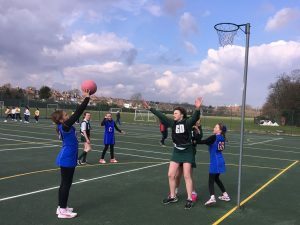 Our first match was against St Aubyn's School and unfortunately the pressure got to the girls and we lost narrowly by 1 – 4. 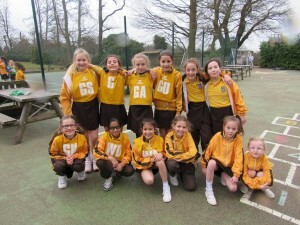 The second match was against Forest where we won 7 – 0 and our final match against Chigwell was for second place overall. 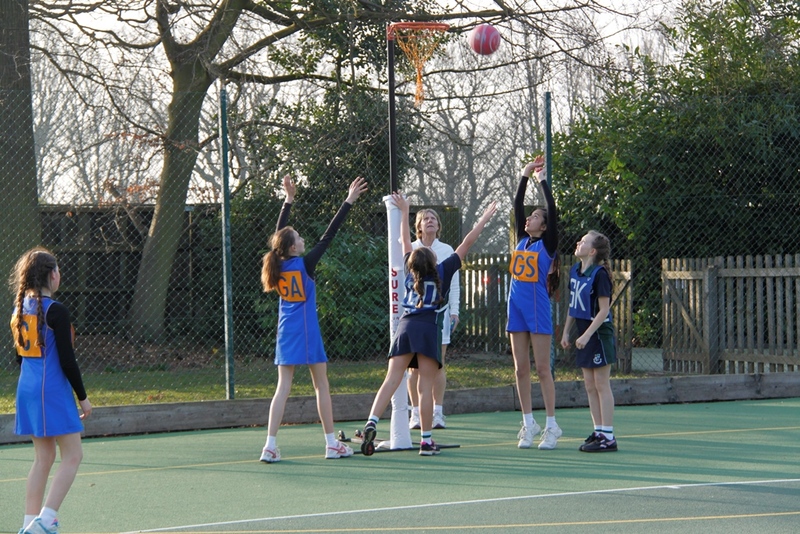 Our girls fought for every ball and shot really well, winning of 6 – 3. ISA National Netball Winners 2014! 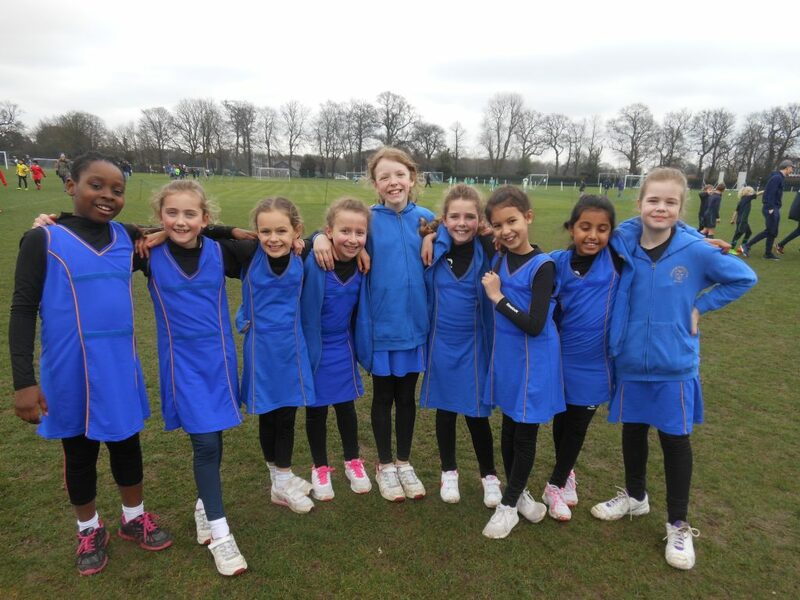 On Thursday 20th March the U11 Netball Team travelled to Rugby School to participate in the ISA National Netball Tournament. The girls won every game in their pool, qualifying for the quarter finals. They won their quarter and semi final matches and now faced Littlegarth in the final. This match was the most tense match ever - luckily we had the first centre pass from which we scored, then Littlegarth had their centre pass which they scored from, this format continued until the score was 5 – 4 to us at which time the final whistle blew making us national winners! 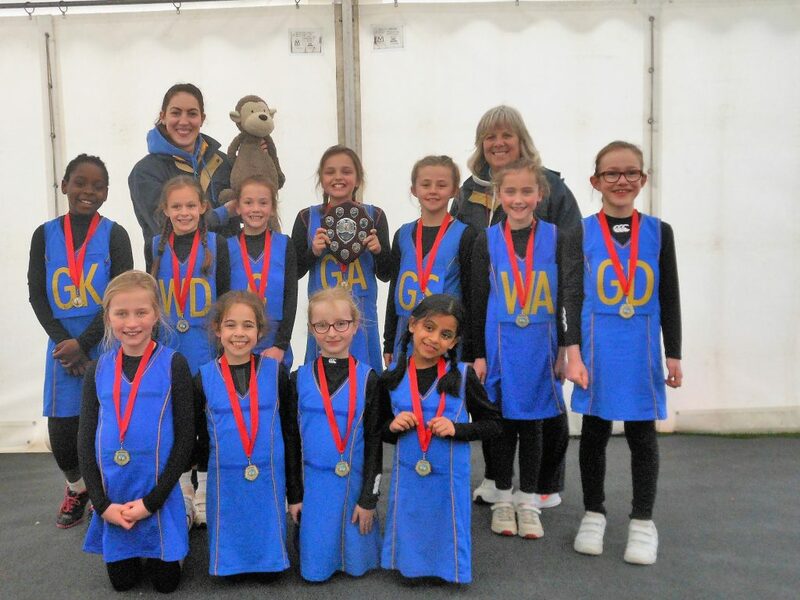 I am sure you will join me in congratulating our U11 Netball team for being the best team in the country; this is an outstanding achievement for such a small school. 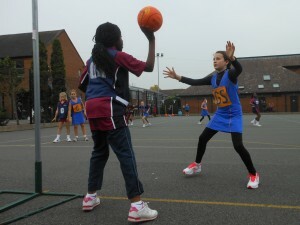 Again we hosted the District U11 Netball rally consisting of 12 local primary schools. The teams were put into two pools where a round robin rally was played to find the 4 strongest teams to play in the semi-finals. Our team played extremely well through the early rounds winning all of their matches, scoring 11– 0 in two of their matches. They met Woodlands School in the semi-final where they won 7–2 taking them into the final. Here they met Ingrave Johnstone who beaten St Peter’s in the other semi-final. Our girls were determined to win the shield again and a gold medal, so fought for every ball and shot every successful goal. The final winning score was 8–2 to us and we were crowned winners once again. 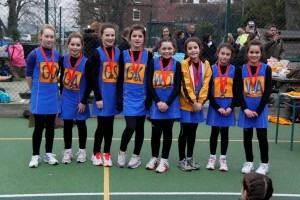 On Monday, 10th February the School hosted the ISA East Anglia Regional U11 Netball Tournament. The weather was its usual unpredictable self, with various weather forecasts changing by the hour. The decision was made to go ahead with the tournament and the rain looked as if it was going to stay away until the sky started to go black around 3pm. There were 8 schools due to compete in the tournament but unfortunately one school had to withdraw at the last moment. 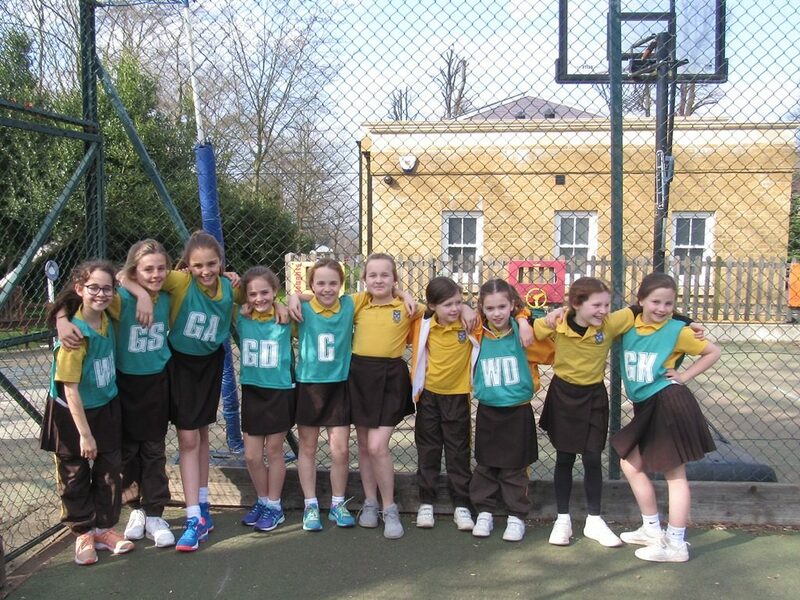 The Ursuline ‘B’ Team made up of children from Year 4, 5 and 6 kindly agreed to participate at the last moment in order that the tournament could progress as planned. 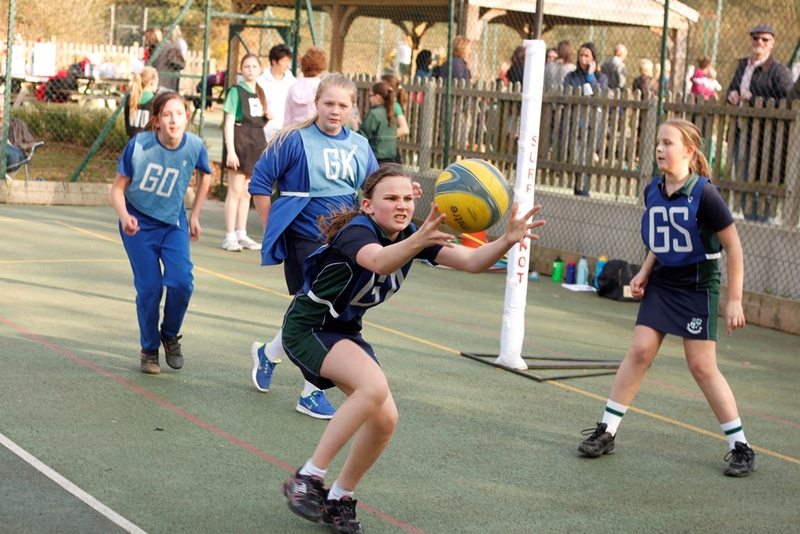 Represented schools were Alleyn Court, Cambridge International, Heathcote Preparatory, Littlegarth School, Sacred Heart, St. Margaret’s Preparatory and the Ursuline Preparatory. 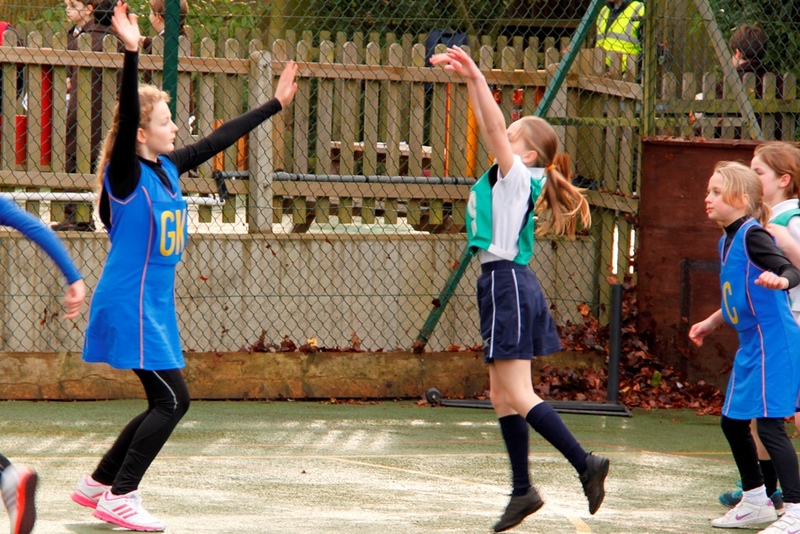 There were some exciting games taking part on both netball courts as the teams competed in their pools. 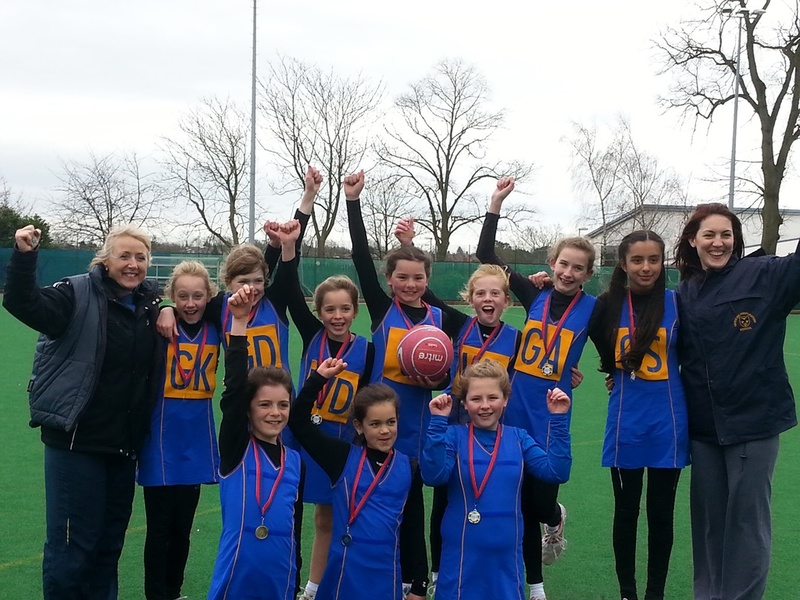 Littlegarth School and Ursuline 'A' both won their respective pools. Just before the semi-finals began the weather decided to change and the clouds opened! 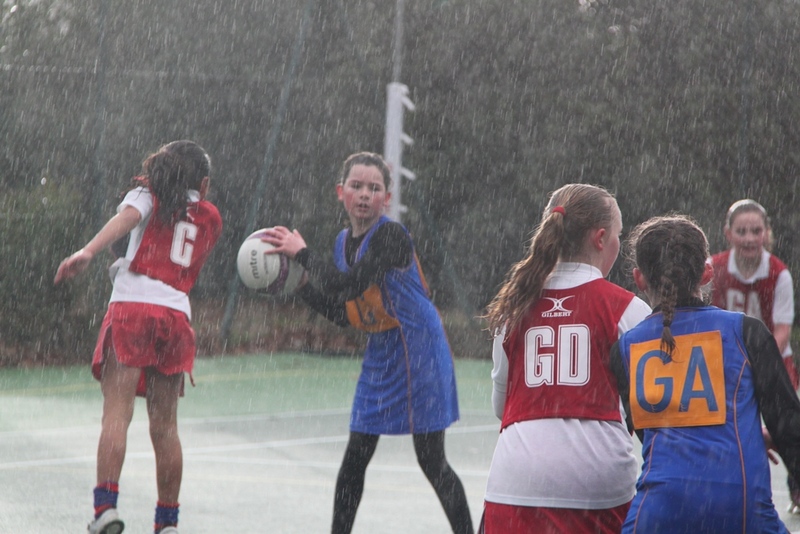 The tournament continued and the girls played on in very difficult conditions. The final saw Littlegarth and Ursuline 'A' competing against each other. Ursuline ''A' suffered their first defeat of the day losing 3 – 7. 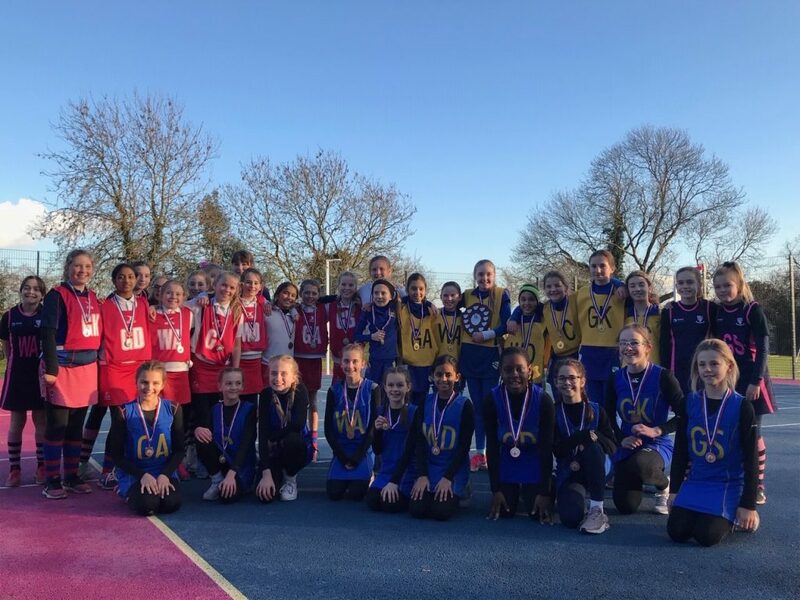 The top three teams, Littlegarth, Ursuline 'A' and Alleyn Court, qualified for the national event of this tournament which will take place towards the end of the netball season. A final thank you to the staff that organised this very successful day, not forgetting to thank the PFA who provided wonderful refreshments to both spectators and competitors throughout the afternoon. Please see a selection of photographs taken during the event below.